This article is about the history of Islam as a culture and polity. For a history of the Islamic faith, see Islamic schools and branches. In 610 CE, Muhammad began receiving what Muslims consider to be divine revelations. Muhammad's message won over a handful of followers and was met with increasing opposition from Meccan notables. In 618, after he lost protection with the death of his influential uncle Abu Talib, Muhammad migrated to the city of Yathrib (now known as Medina). With Muhammad's death in 632, disagreement broke out over who would succeed him as leader of the Muslim community. In the early 13th century, the Delhi Sultanate took over the northern parts of the Indian subcontinent. In the 13th and 14th centuries, destructive Mongol invasions and those of Tamerlane from the East, along with the loss of population in the Black Death, greatly weakened the traditional centers of the Islamic world, stretching from Persia to Egypt. Islamic Iberia was gradually conquered by Christian forces during the Reconquista. Nonetheless, in the Early Modern period, the Ottomans, the Safavids, and the Mughals were able to create new world powers again. During the 19th and early 20th centuries, most parts of the Muslim world fell under the influence or direct control of European "Great Powers." Their efforts to win independence and build modern nation states over the course of the last two centuries continue to reverberate to the present day. The following timeline can serve as a rough visual guide to the most important polities in the Islamic world prior to the First World War. It covers major historical centers of power and culture, including Arabia, Mesopotamia (modern Iraq), Persia (modern Iran), Levant (modern Syria, Lebanon, Jordan and Israel/Palestine), Egypt, Maghreb (north-west Africa), al-Andalus (Iberia), Transoxania (Central Asia), Hindustan (including modern Pakistan), and Anatolia (modern Turkey). It is necessarily an approximation, since rule over some regions was sometimes divided among different centers of power, and authority in larger polities was often distributed among several dynasties. For example, during the later stages of the Abbasid Caliphate, even the capital city of Baghdad was effectively ruled by other dynasties such as the Buyyids and the Seljuks, while the Ottomans commonly delegated executive authority over outlying provinces to local potentates, such as the Deys of Algiers, the Beys of Tunis, and the Mamluks of Iraq. Dates are approximate, consult particular articles for details. The study of the earliest periods in Islamic history is made difficult by a lack of sources. For example, the most important historiographical source for the origins of Islam is the work of al-Tabari. While al-Tabari was an excellent historian by the standards of his time and place, use of his work as a source is problematic for two reasons. For one, his style of historical writing permitted liberal use of mythical, legendary, stereotyped, distorted, and polemical presentations of its subject matter. Second, al-Tabari's descriptions of the beginning of Islam post-date the events by a large amount of time, al-Tabari having died in 923. Differing views about how to deal with the available sources has led to the development of four different approaches to the history of early Islam. All four methods have some level of support today. The descriptive method uses the outlines of Islamic traditions, while being adjusted for the stories of miracles and faith-centred claims within those sources. Edward Gibbon and Gustav Weil represent some of the first historians following the descriptive method. On the source critical method, a comparison of all the sources is sought in order to identify which informants to the sources are weak and thereby distinguish spurious material. The work of William Montgomery Watt and that of Wilferd Madelung are two source critical examples. On the tradition critical method, the sources are believed to be based on oral traditions with unclear origins and transmission history, and so are treated very cautiously. Ignaz Goldziher was the pioneer of the tradition critical method, and Uri Rubin gives a contemporary example. The skeptical method doubts nearly all of the material in the traditional sources, regarding any possible historical core as too difficult to decipher from distorted and fabricated material. An early example of the skeptical method was the work of John Wansbrough. Nowadays, the popularity of the different methods employed varies on the scope of the works under consideration. For overview treatments of the history of early Islam, the descriptive approach is more popular. For scholars who look at the beginnings of Islam in depth, the source critical and tradition critical methods are more often followed. After the 8th century, the quality of sources improves. Those sources which treated earlier times with a large temporal and cultural gap now begin to give accounts which are more contemporaneous, the quality of genre of available historical accounts improves, and new documentary sources—such as official documents, correspondence and poetry—appear. For the time prior to the beginning of Islam—in the 6th century—sources are superior as well, if still of mixed quality. In particular, the sources covering the Sasanian realm of influence in the 6th century are poor, while the sources for Byzantine areas at the time are of a respectable quality, and complemented by Syriac Christian sources for Syria and Iraq. Islam arose within the context of Late Antiquity. The second half of the sixth century saw political disorder in Arabia, and communication routes were no longer secure. Religious divisions played an important role in the crisis. Judaism became the dominant religion of the Himyarite Kingdom in Yemen after about 380, while Christianity took root in the Persian Gulf. While much of Arabia remained polytheistic, in line with broader trends of the age there was yearning for a more spiritual form of religion. Many were reluctant to convert to a foreign faith, but those faiths provided intellectual and spiritual reference points, and Jewish and Christian loanwords from Aramaic began to replace the old pagan vocabulary of Arabic throughout the peninsula. On the eve of the Islamic era, the Quraysh was the chief tribe of Mecca and a dominant force in western Arabia. To counter the effects of anarchy, they upheld the institution of "sacred months" when all violence was forbidden and travel was safe. The polytheistic Kaaba shrine in Mecca and the surrounding area was a popular pilgrimage destination, which had significant economic consequences for the city. According to tradition, the Islamic prophet Muhammad was born in Mecca around the year 570. His family belonged to the Quraysh. When he was about forty years old he began receiving what Muslims regard as divine revelations delivered through the angel Gabriel, which would later form the Quran. These inspirations enjoined him to proclaim a strict monotheistic faith, to warn his compatriots of the impending Judgement Day, and to castigate social injustices of his city. Muhammad's message won over a handful of followers and was met with increasing opposition from notables of Mecca. In 618, after he lost protection with the death of his influential uncle Abu Talib, Muhammad migrated to the city of Yathrib (subsequently called Medina) where he was joined by his followers. Later generations would count this event, known as the hijra, as the start of the Islamic era. After Muhammad died, a series of four Caliphs governed the Islamic state: Abu Bakr (632–634), Umar ibn al-Khattab (Umar І, 634–644), Uthman ibn Affan, (644–656), and Ali ibn Abi Talib (656–661). These leaders are known as the "Rashidun" or "rightly guided" Caliphs in Sunni Islam. They oversaw the initial phase of the Muslim conquests, advancing through Persia, Levant, Egypt, and North Africa. After Muhammad's death, Abu Bakr, one of his closest associates, was chosen as the first caliph (Arabic: خَليفة‎ khalīfah, lit. successor). Although the office of caliph retained an aura of religious authority, it laid no claim to prophecy. A number of tribal leaders refused to extend agreements made with Muhammad to Abu Bakr, ceasing payments of the alms levy and in some cases claiming to be prophets in their own right. Abu Bakr asserted his authority in a successful military campaign known as the Ridda wars, whose momentum was carried into the lands of the Byzantine and Sasanian empires. By the end of the reign of the second caliph, Umar I, Arab armies, whose battle-hardened ranks were now swelled by the defeated rebels and former imperial auxiliary troops, conquered the Byzantine provinces of Syria and Egypt, while the Sassanids lost their western territories, with the rest to follow soon afterwards. Umar improved administration of the fledgling empire, ordering improvement of irrigation networks and playing a role in foundation of cities like Basra. To be close to the poor, he lived in a simple mud hut without doors and walked the streets every evening. After consulting with the poor, Umar established the Bayt al-mal, a welfare institution for the Muslim and non-Muslim poor, needy, elderly, orphans, widows, and the disabled. The Bayt al-mal ran for hundreds of years under the Rashidun Caliphate in the 7th century and continued through the Umayyad period and well into the Abbasid era. Umar also introduced child benefit for the children and pensions for the elderly. When he felt that a governor or a commander was becoming attracted to wealth or did not meet the required administrative standards, he had him removed from his position. The expansion was partially halted between 638–639 during the years of great famine and plague in Arabia and Levant, respectively, but by the end of Umar's reign, Syria, Egypt, Mesopotamia, and much of Persia were incorporated into the Islamic State. Local populations of Jews and indigenous Christians, who lived as religious minorities and were taxed (while Muslims paid "Zakat") to finance the Byzantine–Sassanid Wars, often aided Muslims to take over their lands from the Byzantines and Persians, resulting in exceptionally speedy conquests. As new areas were conquered, they also benefited from free trade with other areas of the growing Islamic state, where, to encourage commerce, taxes were applied to wealth rather than trade. The Muslims paid Zakat on their wealth for the benefit of the poor. Since the Constitution of Medina, drafted by the Islamic prophet Muhammad, the Jews and the Christians continued to use their own laws and had their own judges. To assist in the quick expansion of the state, the Byzantine and the Persian tax collection systems were maintained and the people paid a poll tax lower than the one imposed under the Byzantines and the Persians. In 639, Muawiyah I was appointed as the governor of Syria after the previous governor died in a plague along with 25,000 other people. To stop the Byzantine harassment from the sea during the Arab–Byzantine wars, in 649 Muawiyah I set up a navy, manned by Monophysitise Christians, Copts and Jacobite Syrian Christians sailors and Muslim troops, which defeated the Byzantine navy at the Battle of the Masts in 655, opening up the Mediterranean to Muslim ships. Early Muslim armies stayed in encampments away from cities because Umar feared that they may get attracted to wealth and luxury, moving away from the worship of God, accumulating wealth and establishing dynasties. Staying in these encampments away from the cities also ensured that there was no stress on the local populations which could remain autonomous. Some of these encampments later grew into cities like Basra and Kufa in Iraq and Fustat in Egypt. When Umar was assassinated in 644, Uthman ibn Affan second cousin and twice son-in-law of Muhammad became the next caliph. As the Arabic language is written without vowels, speakers of different Arabic dialects and other languages recited the Quran with phonetic variations that could alter the meaning of the text. When Uthman ibn Affan became aware of this, he ordered a standard copy of the Quran to be prepared. Begun during his reign, the compilation of the Quran was finished some time between 650 and 656, and copies were sent out to the different centers of the expanding Islamic empire. After Muhammad's death, the old tribal differences between the Arabs started to resurface. Following the Roman–Persian Wars and the Byzantine–Sassanid Wars deep-rooted differences between Iraq (formerly under the Persian Sassanid Empire) and Syria (formerly under the Byzantine Empire) also existed. Each wanted the capital of the newly established Islamic State to be in their area. As Uthman ibn Affan became very old, Marwan I, a relative of Muawiyah I, slipped into the vacuum, becoming his secretary and slowly assuming more control. When Uthman was assassinated in 656, Ali ibn Abi Talib, a cousin and son-in-law of Muhammad, assumed the position of caliph and moved the capital to Kufa in Iraq. Muawiyah I, the governor of Syria, and Marwan I demanded arrest of the culprits. Marwan I manipulated every one and created conflict, which resulted in the first civil war (the "First Fitna"). Ali was assassinated by Kharijites in 661. Six months later in 661, in the interest of peace, Ali's son Hasan, made a peace treaty with Muawiyah I. In the Hasan–Muawiya treaty, Hasan ibn Ali handed over power to Muawiya on the condition that he would be just to the people and not establish a dynasty after his death. Muawiyah subsequently broke the conditions of the agreement and established the Umayyad dynasty, with a capital in Damascus. Husayn ibn Ali, by then Muhammad's only living grandson, refused to swear allegiance to the Umayyads. He was killed in the Battle of Karbala the same year, in an event still mourned by Shia on the Day of Ashura. Unrest, called the Second Fitna continued, but Muslim rule was extended under Muawiyah to Rhodes, Crete, Kabul, Bukhara, and Samarkand, and expanded in North Africa. In 664, Arab armies conquered Kabul, and in 665 pushed into the Maghreb. The Umayyad dynasty (or Ommiads), whose name derives from Umayya ibn Abd Shams, the great-grandfather of the first Umayyad caliph, ruled from 661 to 750. Although the Umayyad family came from the city of Mecca, Damascus was the capital. After the death of Abdu'l-Rahman ibn Abu Bakr in 666, Muawiyah I consolidated his power. Muawiyah I moved his capital to Damascus from Medina, which led to profound changes in the empire. In the same way, at a later date, the transfer of the Caliphate from Damascus to Baghdad marked the accession of a new family to power. As the state grew, the state expenses increased. Additionally the Bayt al-mal and the Welfare State expenses to assist the Muslim and the non-Muslim poor, needy, elderly, orphans, widows, and the disabled, increased, the Umayyads asked the new converts (mawali) to continue paying the poll tax. The Umayyad rule, with its wealth and luxury also seemed at odds with the Islamic message preached by Muhammad. All this increased discontent. The descendants of Muhammad's uncle Abbas ibn Abd al-Muttalib rallied discontented mawali, poor Arabs, and some Shi'a against the Umayyads and overthrew them with the help of the general Abu Muslim, inaugurating the Abbasid dynasty in 750, which moved the capital to Baghdad. 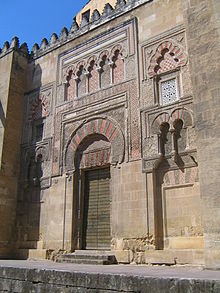 A branch of the Ummayad family fled across North Africa to Al-Andalus, where they established the Caliphate of Córdoba, which lasted until 1031 before falling due to the Fitna of al-Andalus. The Bayt al-mal, the Welfare State then continued under the Abbasids. At its largest extent, the Umayyad dynasty covered more than 5,000,000 square miles (13,000,000 km2) making it one of the largest empires the world had yet seen, and the fifth largest contiguous empire ever. Muawiyah beautified Damascus, and developed a court to rival that of Constantinople. He expanded the frontiers of the empire, reaching the edge of Constantinople at one point, though the Byzantines drove him back and he was unable to hold any territory in Anatolia. Sunni Muslims credit him with saving the fledgling Muslim nation from post-civil war anarchy. However, Shia Muslims accuse him of instigating the war, weakening the Muslim nation by dividing the Ummah, fabricating self-aggrandizing heresies slandering the Prophet's family and even selling his Muslim critics into slavery in the Byzantine empire. One of Muawiyah's most controversial and enduring legacies was his decision to designate his son Yazid as his successor. According to Shi'a doctrine, this was a clear violation of the treaty he made with Hasan ibn Ali. In 682, Yazid restored Uqba ibn Nafi as the governor of North Africa. Uqba won battles against the Berbers and Byzantines. From there Uqba marched thousands of miles westward towards Tangier, where he reached the Atlantic coast, and then marched eastwards through the Atlas Mountains. With about 300 cavalrymen, he proceeded towards Biskra where he was ambushed by a Berber force under Kaisala. Uqba and all his men died fighting. The Berbers attacked and drove Muslims from north Africa for a period. Weakened by the civil wars, the Umayyad lost supremacy at sea, and had to abandon the islands of Rhodes and Crete. Under the rule of Yazid I, some Muslims in Kufa began to think that if Husayn ibn Ali the descendent of Muhammad was their ruler, he would have been more just. He was invited to Kufa but was later betrayed and killed. Imam Husain's son, Imam Ali ibn Husain, was imprisoned along with Husain's sister and other ladies left in Karbala war. Due to opposition by public they were later released and allowed to go to their native place Medina. One Imam after another continued in the generation of Imam Husain but they were opposed by the Caliphs of the day as their rivals till Imam Abdullah al-Mahdi Billah came in power as first Caliph of Fatimid in North Africa when Caliphate and Imamate came to same person again after Imam Ali. These Imams were recognized by Shia Islam taking Imam Ali as first Caliph/ Imam and the same is institutionalised by the Safavids and many similar institutions named now as Ismaili, Twelver etc. The period under Muawiya II was marked by civil wars (Second Fitna). This would ease in the reign of Abd al-Malik ibn Marwan, a well-educated and capable ruler. Despite the many political problems that impeded his rule, all important records were translated into Arabic. In his reign, a currency for the Muslim world was minted. This led to war with the Byzantine Empire under Justinian II (Battle of Sebastopolis) in 692 in Asia Minor. The Byzantines were decisively defeated by the Caliph after the defection of a large contingent of Slavs. The Islamic currency was then made the exclusive currency in the Muslim world. He reformed agriculture and commerce. Abd al-Malik consolidated Muslim rule and extended it, made Arabic the state language, and organized a regular postal service. Al-Walid I began the next stage of Islamic conquests. Under him the early Islamic empire reached its farthest extent. He reconquered parts of Egypt from the Byzantine Empire and moved on into Carthage and across to the west of North Africa. Muslim armies under Tariq ibn Ziyad crossed the Strait of Gibraltar and began to conquer the Iberian Peninsula using North African Berber armies. The Visigoths of the Iberian Peninsula were defeated when the Umayyad conquered Lisbon. The Iberian Peninsula was the farthest extent of Islamic control of Europe (they were stopped at the Battle of Tours). In the east, Islamic armies under Muhammad bin Qasim made it as far as the Indus Valley. Under Al-Walid, the caliphate empire stretched from the Iberian Peninsula to India. Al-Hajjaj ibn Yusuf played a crucial role in the organization and selection of military commanders. Al-Walid paid great attention to the expansion of an organized military, building the strongest navy in the Umayyad era., This tactic was crucial for the expansion to the Iberian Peninsula. His reign is considered to be the apex of Islamic power. Sulayman ibn Abd al-Malik was hailed as caliph the day al-Walid died. He appointed Yazid ibn al-Muhallab governor of Mesopotamia. Sulayman ordered the arrest and execution of the family of al-Hajjaj, one of two prominent leaders (the other was Qutayba ibn Muslim) who had supported the succession of al-Walid's son Yazid, rather than Sulayman. Al-Hajjaj had predeceased al-Walid, so he posed no threat. Qutaibah renounced allegiance to Sulayman, though his troops rejected his appeal to revolt. They killed him and sent his head to Sulayman. Sulayman did not move to Damascus on becoming Caliph, remaining in Ramla. Sulayman sent Maslama ibn Abd al-Malik to attack the Byzantine capital (siege of Constantinople). The intervention of Bulgaria on the Byzantine side proved decisive. The Muslims sustained heavy losses. Sulayman died suddenly in 717. Yazid II came to power on the death of Umar II. Yazid fought the Kharijites, with whom Umar had been negotiating, and killed the Kharijite leader Shawdhab. In Yazid's reign, civil wars began in different parts of the empire. Yazid expanded the Caliphate's territory into the Caucasus, before dying in 724. Inheriting the caliphate from his brother, Hisham ibn Abd al-Malik ruled an empire with many problems. He was effective in addressing these problems, and in allowing the Umayyad empire to continue as an entity. His long rule was an effective one, and renewed reforms introduced by Umar II. Under Hisham's rule, regular raids against the Byzantines continued. In North Africa, Kharijite teachings combined with local restlessness to produce the Berber Revolt. He was also faced with a revolt by Zayd ibn Ali. Hisham suppressed both revolts. The Abbasids continued to gain power in Khurasan and Iraq. However, they were not strong enough to make a move yet. Some were caught and punished or executed by eastern governors. The Battle of Akroinon, a decisive Byzantine victory, was during the final campaign of the Umayyad dynasty. Hisham died in 743. Al-Walid II saw political intrigue during his reign. Yazid III spoke out against his cousin Walid's "immorality" which included discrimination on behalf of the Banu Qays Arabs against Yemenis and non-Arab Muslims, and Yazid received further support from the Qadariya and Murji'iya (believers in human free will). Walid was shortly thereafter deposed in a coup. Yazid disbursed funds from the treasury and acceded to the Caliph. He explained that he had rebelled on behalf of the Book of God and the Sunna. Yazid reigned for only six months, while various groups refused allegiance and dissident movements arose, after which he died. Ibrahim ibn al-Walid, named heir apparent by his brother Yazid III, ruled for a short time in 744, before he abdicated. Marwan II ruled from 744 until he was killed in 750. He was the last Umayyad ruler to rule from Damascus. Marwan named his two sons Ubaydallah and Abdallah heirs. He appointed governors and asserted his authority by force. Anti-Umayyad feeling was very prevalent, especially in Iran and Iraq. The Abbasids had gained much support. Marwan's reign as caliph was almost entirely devoted to trying to keep the Umayyad empire together. His death signalled the end of Umayyad rule in the East, and was followed by the massacre of Umayyads by the Abbasids. Almost the entire Umayyad dynasty was killed, except for the talented prince Abd al-Rahman who escaped to the Iberian Peninsula and founded a dynasty there. The Abbasid dynasty rose to power in 750, consolidating the gains of the earlier Caliphates. Initially, they conquered Mediterranean islands including the Balearics and, after, in 827 the Sicily. The ruling party had come to power on the wave of dissatisfaction with the Umayyads, cultivated by the Abbasid revolutionary Abu Muslim. Under the Abbasids Islamic civilization flourished. Most notable was the development of Arabic prose and poetry, termed by The Cambridge History of Islam as its "golden age". Commerce and industry (considered a Muslim Agricultural Revolution) and the arts and sciences (considered a Muslim Scientific Revolution) also prospered under Abbasid caliphs al-Mansur (ruled 754–775), Harun al-Rashid (ruled 786–809), al-Ma'mun (ruled 809–813) and their immediate successors. The capital was moved from Damascus to Baghdad, due to the importance placed by the Abbasids upon eastern affairs in Persia and Transoxania. At this time the caliphate showed signs of fracture amid the rise of regional dynasties. Although the Umayyad family had been killed by the revolting Abbasids, one family member, Abd ar-Rahman I, escaped to Spain and established an independent caliphate there in 756. In the Maghreb, Harun al-Rashid appointed the Arab Aghlabids as virtually autonomous rulers, although they continued to recognise central authority. Aghlabid rule was short-lived, and they were deposed by the Shiite Fatimid dynasty in 909. By around 960, the Fatimids had conquered Abbasid Egypt, building a capital there in 973 called "al-Qahirah" (meaning "the planet of victory", known today as Cairo). In Persia the Turkic Ghaznavids snatched power from the Abbasids. Abbasid influence had been consumed by the Great Seljuq Empire (a Muslim Turkish clan which had migrated into mainland Persia) by 1055. Expansion continued, sometimes by force, sometimes by peaceful proselytising. The first stage in the conquest of India began just before the year 1000. By some 200 (from 1193–1209) years later, the area up to the Ganges river had fallen. In sub-Saharan West Africa, Islam was established just after the year 1000. Muslim rulers were in Kanem starting from sometime between 1081 and 1097, with reports of a Muslim prince at the head of Gao as early as 1009. The Islamic kingdoms associated with Mali reached prominence in the 13th century. The Abbasids developed initiatives aimed at greater Islamic unity. Different sects of the Islamic faith and mosques, separated by doctrine, history, and practice, were pushed to cooperate. The Abbasids also distinguished themselves from the Umayyads by attacking the Umayyads' moral character and administration. According to Ira Lapidus, "The Abbasid revolt was supported largely by Arabs, mainly the aggrieved settlers of Marw with the addition of the Yemeni faction and their Mawali". The Abbasids also appealed to non-Arab Muslims, known as mawali, who remained outside the kinship-based society of the Arabs and were perceived as a lower class within the Umayyad empire. Islamic ecumenism, promoted by the Abbasids, refers to the idea of unity of the Ummah in the literal meaning: that there was a single faith. Islamic philosophy developed as the Shariah was codified, and the four Madhabs were established. This era also saw the rise of classical Sufism. Religious achievements included completion of the canonical collections of Hadith of Sahih Bukhari and others. Islam recognized to a certain extent the validity of the Abrahamic religions, the Quran identifying Jews, Christians, Zoroastrians, and "Sabi'un" or "baptists" (usually taken as a reference to the Mandeans and related Mesopotamian groups) as "people of the book". Toward the beginning of the high Middle Ages, the doctrines of the Sunni and Shia, two major denominations of Islam, solidified and the divisions of the world theologically would form. These trends would continue into the Fatimid and Ayyubid periods. Politically, the Abbasid Caliphate evolved into an Islamic monarchy (unitary system of government.) The regional Sultanate and Emirate governors' existence, validity, or legality were acknowledged for unity of the state. In the early Islamic philosophy of the Iberian Umayyads, Averroes presented an argument in The Decisive Treatise, providing a justification for the emancipation of science and philosophy from official Ash'ari theology; thus, Averroism has been considered a precursor to modern secularism. According to Arab sources in the year 750, Al-Saffah, the founder of the Abbasid Caliphate, launched a massive rebellion against the Umayyad Caliphate from the province of Khurasan near Talas. After eliminating the entire Umayyad family and achieving victory at the Battle of the Zab, Al-Saffah and his forces marched into Damascus and founded a new dynasty. His forces confronted many regional powers and consolidated the realm of the Abbasid Caliphate. In Al-Mansur's time, Persian scholarship emerged. Many non-Arabs converted to Islam. The Umayyads actively discouraged conversion in order to continue the collection of the jizya, or the tax on non-Muslims. Islam nearly doubled within its territory from 8% of residents in 750 to 15% by the end of Al-Mansur's reign. Al-Mahdi, whose name means "Rightly-guided" or "Redeemer", was proclaimed caliph when his father was on his deathbed. Baghdad blossomed during Al-Mahdi's reign, becoming the world's largest city. It attracted immigrants from Arabia, Iraq, Syria, Persia and as far away as India and Spain. Baghdad was home to Christians, Jews, Hindus, and Zoroastrians, in addition to the growing Muslim population. Like his father, Al-Hadi was open to his people and allowed citizens to address him in the palace at Baghdad. He was considered an "enlightened ruler", and continued the policies of his Abbasid predecessors. His short rule was plagued by military conflicts and internal intrigue. The military conflicts subsided as Harun al-Rashid ruled. His reign was marked by scientific, cultural and religious prosperity. He established the library Bayt al-Hikma ("House of Wisdom"), and the arts and music flourished during his reign. The Barmakid family played a decisive advisorial role in establishing the Caliphate, but declined during Rashid's rule. Al-Amin received the Caliphate from his father Harun Al-Rashid, but failed to respect the arrangements made for his brothers, leading to the Fourth Fitna. Al-Ma'mun's general Tahir ibn Husayn took Baghdad, executing Al-Amin. The war led to a loss of prestige for the dynasty. The Abbasids soon became caught in a three-way rivalry among Coptic Arabs, Indo-Persians, and immigrant Turks. In addition, the cost of running a large empire became too great. The Turks, Egyptians, and Arabs adhered to the Sunnite sect; the Persians, a great portion of the Turkic groups, and several of the princes in India were Shia. The political unity of Islam began to disintegrate. Under the influence of the Abbasid caliphs, independent dynasties appeared in the Muslim world and the caliphs recognized such dynasties as legitimately Muslim. The first was the Tahirid dynasty in Khorasan, which was founded during the caliph Al-Ma'mun's reign. Similar dynasties included the Saffarids, Samanids, Ghaznavids and Seljuqs. During this time, advancements were made in the areas of astronomy, poetry, philosophy, science, and mathematics. Upon Al-Amin's death, Al-Ma'mun became Caliph. Al-Ma'mun extended the Abbasid empire's territory during his reign and dealt with rebellions. Al-Ma'mun had been named governor of Khurasan by Harun, and after his ascension to power, the caliph named Tahir as governor of his military services in order to assure his loyalty. Tahir and his family became entrenched in Iranian politics and became powerful, frustrating Al-Ma'mun's desire to centralize and strengthen Caliphal power. The rising power of the Tahirid dynasty became a threat as Al-Ma'mun's own policies alienated them and other opponents. Al-Ma'mun worked to centralize power and ensure a smooth succession. Al-Mahdi proclaimed that the caliph was the protector of Islam against heresy, and also claimed the ability to declare orthodoxy. Religious scholars averred that Al-Ma'mun was overstepping his bounds in the Mihna, the Abbasid inquisition which he introduced in 833 four months before he died. The Ulama emerged as a force in Islamic politics during Al-Ma'mun's reign for opposing the inquisitions. The Ulema and the major Islamic law schools took shape in the period of Al-Ma'mun. In parallel, Sunnism became defined as a religion of laws. Doctrinal differences between Sunni and Shi'a Islam became more pronounced. During the Al-Ma'mun regime, border wars increased. Al-Ma'mun made preparations for a major campaign, but died while leading an expedition in Sardis. Al-Ma'mun gathered scholars of many religions at Baghdad, whom he treated well and with tolerance. He sent an emissary to the Byzantine Empire to collect the most famous manuscripts there, and had them translated into Arabic. His scientists originated alchemy. Shortly before his death, during a visit to Egypt in 832, the caliph ordered the breaching of the Great Pyramid of Giza to search for knowledge and treasure. Workers tunneled in near where tradition located the original entrance. Al-Ma'mun later died near Tarsus under questionable circumstances and was succeeded by his half-brother, Al-Mu'tasim, rather than his son, Al-Abbas ibn Al-Ma'mun. As Caliph, Al-Mu'tasim promptly ordered the dismantling of al-Ma'mun's military base at Tyana. He faced Khurramite revolts. One of the most difficult problems facing this Caliph was the ongoing uprising of Babak Khorramdin. Al-Mu'tasim overcame the rebels and secured a significant victory. Byzantine emperor Theophilus launched an attack against Abbasid fortresses. Al-Mu'tasim sent Al-Afshin, who met and defeated Theophilus' forces at the Battle of Anzen. On his return he became aware of a serious military conspiracy which forced him and his successors to rely upon Turkish commanders and ghilman slave-soldiers (foreshadowing the Mamluk system). The Khurramiyyah were never fully suppressed, although they slowly declined during the reigns of succeeding Caliphs. Near the end of al-Mu'tasim's life there was an uprising in Palestine, but he defeated the rebels. During Al-Mu'tasim's reign, the Tahirid dynasty continued to grow in power. The Tahirids were exempted from many tribute and oversight functions. Their independence contributed to Abbasid decline in the east. Ideologically, al-Mu'tasim followed his half-brother al-Ma'mun. He continued his predecessor's support for the Islamic Mu'tazila sect, applying brutal torture against the opposition. Arab mathematician Al-Kindi was employed by Al-Mu'tasim and tutored the Caliph's son. Al-Kindi had served at the House of Wisdom and continued his studies in Greek geometry and algebra under the caliph's patronage. Al-Wathiq succeeded his father. Al-Wathiq dealt with opposition in Arabia, Syria, Palestine and in Baghdad. Using a famous sword he personally joined the execution of the Baghdad rebels. The revolts were the result of an increasingly large gap between Arab populations and the Turkish armies. The revolts were put down, but antagonism between the two groups grew, as Turkish forces gained power. He also secured a captive exchange with the Byzantines. Al-Wathiq was a patron of scholars, as well as artists. He personally had musical talent and is reputed to have composed over one hundred songs. When Al-Wathiq died of high fever, Al-Mutawakkil succeeded him. Al-Mutawakkil's reign is remembered for many reforms and is viewed as a golden age. He was the last great Abbasid caliph; after his death the dynasty fell into decline. Al-Mutawakkil ended the Mihna. 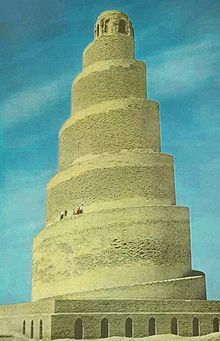 Al-Mutawakkil built the Great Mosque of Samarra as part of an extension of Samarra eastwards. During his reign, Al-Mutawakkil met famous Byzantine theologian Constantine the Philosopher, who was sent to strengthen diplomatic relations between the Empire and the Caliphate by Emperor Michael III. Al-Mutawakkil involved himself in religious debates, as reflected in his actions against minorities. The Shīʻi faced repression embodied in the destruction of the shrine of Hussayn ibn ʻAlī, an action that was ostensibly carried out to stop pilgrimages. Al-Mutawakkil continued to rely on Turkish statesmen and slave soldiers to put down rebellions and lead battles against foreign empires, notably capturing Sicily from the Byzantines. Al-Mutawakkil was assassinated by a Turkish soldier. Al-Muntasir succeeded to the Caliphate on the same day with the support of the Turkish faction, though he was implicated in the murder. The Turkish party had al-Muntasir remove his brothers from the line of succession, fearing revenge for the murder of their father. Both brothers wrote statements of abdication. During his reign, Al-Muntasir removed the ban on pilgrimage to the tombs of Hassan and Hussayn and sent Wasif to raid the Byzantines. Al-Muntasir died of unknown causes. The Turkish chiefs held a council to select his successor, electing Al-Musta'in. The Arabs and western troops from Baghdad were displeased at the choice and attacked. However, the Caliphate no longer depended on Arabian choice, but depended on Turkish support. After the failed Muslim campaign against the Christians, people blamed the Turks for bringing disaster on the faith and murdering their Caliphs. After the Turks besieged Baghdad, Al-Musta'in planned to abdicate to Al-Mu'tazz but was put to death by his order. Al-Mu'tazz was enthroned by the Turks, becoming the youngest Abbasaid Caliph to assume power. Al-Mu'tazz proved too apt a pupil of his Turkish masters, but was surrounded by parties jealous of each other. At Samarra, the Turks were having problems with the "Westerns" (Berbers and Moors), while the Arabs and Persians at Baghdad, who had supported al-Musta'in, regarded both with equal hatred. Al-Mu'tazz put his brothers Al-Mu'eiyyad and Abu Ahmed to death. The ruler spent recklessly, causing a revolt of Turks, Africans, and Persians for their pay. Al-Mu'tazz was brutally deposed shortly thereafter. Al-Muhtadi became the next Caliph. He was firm and virtuous compared to the earlier Caliphs, though the Turks held the power. The Turks killed him soon after his ascension. Al-Mu'tamid followed, holding on for 23 years, though he was largely a ruler in name only. After the Zanj Rebellion, Al-Mu'tamid summoned al-Muwaffak to help him. Thereafter, Al-Muwaffaq ruled in all but name. The Hamdanid dynasty was founded by Hamdan ibn Hamdun when he was appointed governor of Mardin in Anatolia by the Caliphs in 890. Al-Mu'tamid later transferred authority to his son, al-Mu'tadid, and never regained power. The Tulunids became the first independent state in Islamic Egypt, when they broke away during this time. Al-Mu'tadid ably administered the Caliphate. Egypt returned to allegiance and Mesopotamia was restored to order. He was tolerant towards Shi'i, but toward the Umayyad community he was not so just. Al-Mu'tadid was cruel in his punishments, some of which are not surpassed by those of his predecessors. For example, the Kharijite leader at Mosul was paraded about Baghdad clothed in a robe of silk, of which Kharijites denounced as sinful, and then crucified. Upon Al-Mu'tadid's death, his son by a Turkish slave-girl, Al-Muktafi, succeeded to the throne. Al-Muktafi became a favorite of the people for his generosity, and for abolishing his father's secret prisons, the terror of Baghdad. During his reign, the Caliphate overcame threats such as the Carmathians. Upon Al-Muktafi's death, the vazir next chose Al-Muqtadir. Al-Muqtadir's reign was a constant succession of thirteen Vazirs, one rising on the fall or assassination of another. His long reign brought the Empire to its lowest ebb. Africa was lost, and Egypt nearly. Mosul threw off its dependence, and the Greeks raided across the undefended border. The East continued to formally recognise the Caliphate, including those who virtually claimed independence. At the end of the Early Baghdad Abbasids period, Empress Zoe Karbonopsina pressed for an armistice with Al-Muqtadir and arranged for the ransom of the Muslim prisoner while the Byzantine frontier was threatened by Bulgarians. This only added to Baghdad's disorder. Though despised by the people, Al-Muqtadir was again placed in power after upheavals. Al-Muqtadir was eventually slain outside the city gates, whereupon courtiers chose his brother al-Qahir. He was even worse. Refusing to abdicate, he was blinded and cast into prison. His son Ar-Radi took over only to experience a cascade of misfortune. Praised for his piety, he became the tool of the de facto ruling Minister, Ibn Raik (amir al-umara; 'Amir of the Amirs'). Ibn Raik held the reins of government and his name was joined with the Caliph's in public prayers. Around this period, the Hanbalis, supported by popular sentiment, set up in fact a kind of 'Sunni inquisition'. Ar-Radi is commonly regarded as the last of the real Caliphs: the last to deliver orations at the Friday service, to hold assemblies, to commune with philosophers, to discuss the questions of the day, to take counsel on the affairs of State; to distribute alms, or to temper the severity of cruel officers. Thus ended the Early Baghdad Abbasids. In the late mid-930s, the Ikhshidids of Egypt carried the Arabic title "Wali" reflecting their position as governors on behalf of the Abbasids, The first governor (Muhammad bin Tughj Al-Ikhshid) was installed by the Abbasid Caliph. They gave him and his descendants the Wilayah for 30 years. The last name Ikhshid is Soghdian for "prince". Also in the 930s, ‘Alī ibn Būyah and his two younger brothers, al-Hassan and Aḥmad founded the Būyid confederation. Originally a soldier in the service of the Ziyārīds of Ṭabaristān, ‘Alī was able to recruit an army to defeat a Turkish general from Baghdad named Yāqūt in 934. Over the next nine years the three brothers gained control of the remainder of the caliphate, while accepting the titular authority of the caliph in Baghdad. The Būyids made large territorial gains. Fars and Jibal were conquered. Central Iraq submitted in 945, before the Būyids took Kermān (967), Oman (967), the Jazīra (979), Ṭabaristān (980), and Gorgan (981). After this the Būyids went into slow decline, with pieces of the confederation gradually breaking off and local dynasties under their rule becoming de facto independent. At the beginning of the Middle Baghdad Abbasids, the Caliphate had become of little importance. The amir al-umara Bajkam contented himself with dispatching his secretary to Baghdad to assemble local dignitaries to elect a successor. The choice fell on Al-Muttaqi. Bajkam was killed on a hunting party by marauding Kurds. In the ensuing anarchy in Baghdad, Ibn Raik persuaded the Caliph to flee to Mosul where he was welcomed by the Hamdanids. They assassinated Ibn Raik. Hamdanid Nasir al-Dawla advanced on Baghdad, where mercenaries and well-organised Turks repelled them. Turkish general Tuzun became amir al-umara. The Turks were staunch Sunnis. A fresh conspiracy placed the Caliph in danger. Hamdanid troops helped ad-Daula escape to Mosul and then to Nasibin. Tuzun and the Hamdanid were stalemated. Al-Muttaqi was at Raqqa, moving to Tuzun where he was deposed. Tuzun installed the blinded Caliph's cousin as successor, with the title of Al-Mustakfi. With the new Caliph, Tuzun attacked the Buwayhid dynasty and the Hamdanids. Soon after, Tuzun died, and was succeeded by one of his generals, Abu Ja'far. The Buwayhids then attacked Baghdad, and Abu Ja'far fled into hiding with the Caliph. Buwayhid Sultan Muiz ud-Daula assumed command forcing the Caliph into abject submission to the Amir. Eventually, Al-Mustakfi was blinded and deposed. The city fell into chaos, and the Caliph's palace was looted. Once the Buwayhids controlled Baghdad, Al-Muti became caliph. The office was shorn of real power and Shi'a observances were established. The Buwayhids held on Baghdad for over a century. Throughout the Buwayhid reign the Caliphate was at its lowest ebb, but was recognized religiously, except in Iberia. Buwayhid Sultan Mu'izz al-Dawla was prevented from raising a Shi'a Caliph to the throne by fear for his own safety, and fear of rebellion, in the capital and beyond. The next Caliph, Al-Ta'i, reigned over factional strife in Syria among the Fatimids, Turks, and Carmathians. The Hideaway dynasyty also fractured. The Abbasid borders were the defended only by small border states. Baha' al-Dawla, the Buyid amir of Iraq, deposed al-Ta'i in 991 and proclaimed al-Qadir the new caliph. During al-Qadir's Caliphate, Mahmud of Ghazni looked after the empire. Mahmud of Ghazni, of Eastern fame, was friendly towards the Caliphs, and his victories in the Indian Empire were accordingly announced from the pulpits of Baghdad in grateful and glowing terms. Al-Qadir fostered the Sunni struggle against Shiʿism and outlawed heresies such as the Baghdad Manifesto and the doctrine that the Quran was created. He outlawed the Muʿtazila, bringing an end to the development of rationalist Muslim philosophy. During this and the next period, Islamic literature, especially Persian literature, flourished under the patronage of the Buwayhids. By 1000, the global Muslim population had climbed to about 4 percent of the world, compared to the Christian population of 10 percent. During Al-Qa'im's reign, the Buwayhid ruler often fled the capital and the Seljuq dynasty gained power. Toghrül overran Syria and Armenia. He then made his way into the Capital, where he was well-received both by chiefs and people. In Bahrain, the Qarmatian state collapsed in Al-Hasa. Arabia recovered from the Fatimids and again acknowledged the spiritual jurisdiction of the Abbasids. Al-Muqtadi was honored by the Seljuq Sultan Malik-Shah I, during whose reign the Caliphate was recognized throughout the extending range of Seljuq conquest. The Sultan was critical of the Caliph's interference in affairs of state, but died before deposing the last of the Middle Baghdad Abbasids. The Late Baghdad Abbasids reigned from the beginning of the Crusades to the Seventh Crusade. The first Caliph was Al-Mustazhir. He was politically irrelevant, despite civil strife at home and the First Crusade in Syria. Raymond IV of Toulouse attempted to attack Baghdad, losing at the Battle of Manzikert. The global Muslim population climbed to about 5 per cent as against the Christian population of 11 per cent by 1100. Jerusalem was captured by crusaders who massacred its inhabitants. Preachers travelled throughout the caliphate proclaiming the tragedy and rousing men to recover the Al-Aqsa Mosque from the Franks (European Crusaders). Crowds of exiles rallied for war against the infidel. Neither the Sultan nor the Caliph sent an army west. Al-Mustarshid achieved more independence while the sultan Mahmud II of Great Seljuq was engaged in war in the East. The Banu Mazyad (Mazyadid State) general, Dubays ibn Sadaqa (emir of Al-Hilla), plundered Bosra and attacked Baghdad together with a young brother of the sultan, Ghiyath ad-Din Mas'ud. Dubays was crushed by a Seljuq army under Zengi, founder of the Zengid dynasty. Mahmud's death was followed by a civil war between his son Dawud, his nephew Mas'ud and the atabeg Toghrul II. Zengi was recalled to the East, stimulated by the Caliph and Dubays, where he was beaten. The Caliph then laid siege to Mosul for three months without success, resisted by Mas'ud and Zengi. It was nonetheless a milestone in the caliphate's military revival. After the siege of Damascus (1134), Zengi undertook operations in Syria. Al-Mustarshid attacked sultan Mas'ud of western Seljuq and was taken prisoner. He was later found murdered. His son, Al-Rashid failed to gain independence from Seljuq Turks. Zengi, because of the murder of Dubays, set up a rival Sultanate. Mas'ud attacked; the Caliph and Zengi, hopeless of success, escaped to Mosul. The Sultan regained power, a council was held, the Caliph was deposed, and his uncle, son of Al-Muqtafi, appointed as the new Caliph. Ar-Rashid fled to Isfahan and was killed by Hashshashins. Continued disunion and contests between Seljuq Turks allowed al-Muqtafi to maintain control in Baghdad and to extend it throughout Iraq. In 1139, al-Muqtafi granted protection to the Nestorian patriarch Abdisho III. 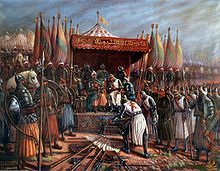 While the Crusade raged, the Caliph successfully defended Baghdad against Muhammad II of Seljuq in the Siege of Baghdad (1157). The Sultan and the Caliph dispatched men in response to Zengi's appeal, but neither the Seljuqs, nor the Caliph, nor their Amirs, dared resist the Crusaders. The next caliph, Al-Mustanjid, saw Saladin extinguish the Fatimid dynasty after 260 years, and thus the Abbasids again prevailed. Al-Mustadi reigned when Saladin become the sultan of Egypt and declared allegiance to the Abbasids. An-Nasir, "The Victor for the Religion of God", attempted to restore the Caliphate to its ancient dominant role. He consistently held Iraq from Tikrit to the Gulf without interruption. His forty-seven year reign was chiefly marked by ambitious and corrupt dealings with the Tartar chiefs, and by his hazardous invocation of the Mongols, which ended his dynasty. His son, Az-Zahir, was Caliph for a short period before his death and An-Nasir's grandson, Al-Mustansir, was made caliph. Al-Mustansir founded the Mustansiriya Madrasah. In 1236 Ögedei Khan commanded to raise up Khorassan and populated Herat. The Mongol military governors mostly made their camp in Mughan plain, Azerbaijan. The rulers of Mosul and Cilician Armenia surrendered. Chormaqan divided the Transcaucasia region into three districts based on military hierarchy. In Georgia, the population were temporarily divided into eight tumens. By 1237 the Mongol Empire had subjugated most of Persia, excluding Abbasid Iraq and Ismaili strongholds, and all of Afghanistan and Kashmir. Al-Musta'sim was the last Abbasid Caliph in Baghdad and is noted for his opposition to the rise of Shajar al-Durr to the Egyptian throne during the Seventh Crusade. To the east, Mongol forces under Hulagu Khan swept through the Transoxiana and Khorasan. Baghdad was sacked and the caliph deposed soon afterwards. The Mamluk sultans and Syria later appointed a powerless Abbasid Caliph in Cairo. The Abbasid "shadow" caliph of Cairo reigned under the tutelage of the Mamluk sultans and nominal rulers used to legitimize the actual rule of the Mamluk sultans. All the Cairene Abbasid caliphs who preceded or succeeded Al-Musta'in were spiritual heads lacking any temporal power. Al-Musta'in was the only Cairo-based Abbasid caliph to even briefly hold political power. Al-Mutawakkil III was the last "shadow" caliph. In 1517, Ottoman sultan Selim I defeated the Mamluk Sultanate, and made Egypt part of the Ottoman Empire. The Fatimids originated in Ifriqiya (modern-day Tunisia and eastern Algeria). The dynasty was founded in 909 by ʻAbdullāh al-Mahdī Billah, who legitimised his claim through descent from Muhammad by way of his daughter Fātima as-Zahra and her husband ʻAlī ibn-Abī-Tālib, the first Shīʻa Imām, hence the name al-Fātimiyyūn "Fatimid". The Fatamids and the Zaydis at the time, used the Hanafi jurisprudence, as did most Sunnis. Abdullāh al-Mahdi's control soon extended over all of central Maghreb, an area consisting of the modern countries of Morocco, Algeria, Tunisia and Libya, which he ruled from Mahdia, his capital in Tunisia. The Fatimids entered Egypt in the late 10th century, conquering the Ikhshidid dynasty and founding a capital at al-Qāhira(Cairo) in 969. The name was a reference to the planet Mars, "The Subduer", which was prominent in the sky at the moment that city construction started. Cairo was intended as a royal enclosure for the Fatimid caliph and his army, though the actual administrative and economic capital of Egypt was in cities such as Fustat until 1169. After Egypt, the Fatimids continued to conquer surrounding areas until they ruled from Tunisia to Syria and even crossed the Mediterranean into Sicily and southern Italy. Under the Fatimids, Egypt became the center of an empire that included at its peak North Africa, Sicily, Palestine, Lebanon, Syria, the Red Sea coast of Africa, Yemen and the Hejaz. Egypt flourished, and the Fatimids developed an extensive trade network in both the Mediterranean and the Indian Ocean. Their trade and diplomatic ties extended all the way to China and its Song dynasty, which determined the economic course of Egypt during the High Middle Ages. Unlike other governments in the area, Fatimid advancement in state offices was based more on merit than heredity. Members of other branches of Islam, including Sunnis, were just as likely to be appointed to government posts as Shiites. Tolerance covered non-Muslims such as Christians and Jews; they took high levels in government based on ability. There were, however, exceptions to this general attitude of tolerance, notably Al-Hakim bi-Amr Allah. The Fatimid palace was in two parts. It was in the Khan el-Khalili area at Bin El-Quasryn street. During the beginning of the Middle Baghdad Abbasids, the Fatimid Caliphs claimed spiritual supremacy not only in Egypt, but also contested the religious leadership of Syria. At the beginning of the Abbasid realm in Baghdad, the Alids faced severe persecution by the ruling party as they were a direct threat to the Caliphate. Owing to the Abbasid inquisitions, the forefathers opted for concealment of the Dawa's existence. Subsequently, they traveled towards the Iranian Plateau and distanced themselves from the epicenter of the political world. Al Mahdi's father, Al Husain al Mastoor returned to control the Dawa's affairs. He sent two Dai's to Yemen and Western Africa. Al Husain died soon after the birth of his son, Al Mahdi. A system of government helped update Al Mahdi on the development which took place in North Africa. "Islamic Cairo" building was named after Al-Hakim bi-Amr Allah, built by Fatimid vizier Gawhar Al-Siqilli, and extended by Badr al-Jamali. Al Mahdi Abdullah al-Mahdi Billah established the first Imam of the Fatimid dynasty. He claimed genealogic origins dating as far back as Fatimah through Husayn and Ismail. Al Mahdi established his headquarters at Salamiyah and moved towards north-western Africa, under Aghlabid rule. His success of laying claim to being the precursor to the Mahdi was instrumental among the Berber tribes of North Africa, specifically the Kutamah tribe. Al Mahdi established himself at the former Aghlabid residence at Raqqadah, a suburb of Al-Qayrawan in Tunisia. In 920, Al Mahdi took up residence at the newly established capital of the empire, Al-Mahdiyyah. After his death, Al Mahdi was succeeded by his son, Abu Al-Qasim Muhammad Al-Qaim, who continued his expansionist policy. At the time of his death he had extended his reign to Morocco of the Idrisids, as well as Egypt itself.The Fatimid Caliphate grew to include Sicily and to stretch across North Africa from the Atlantic Ocean to Libya. Abdullāh al-Mahdi's control soon extended over all of central Maghreb, an area consisting of the modern countries of Morocco, Algeria, Tunisia, and Libya, which he ruled from Mahdia, in Tunisia. Newly built capital Al-Mansuriya,[a] or Mansuriyya (Arabic: المنصوريه‎), near Kairouan, Tunisia, was the capital of the Fatimid Caliphate during the rules of the Imams Al-Mansur Billah (r. 946–953) and Al-Mu'izz li-Din Allah (r. 953–975). Under the Fatimids, Egypt became the center of an empire that included at its peak North Africa, Sicily, Palestine, Jordan, Lebanon, Syria, the Red Sea coast of Africa, Tihamah, Hejaz, and Yemen. Egypt flourished, and the Fatimids developed an extensive trade network in both the Mediterranean and the Indian Ocean. Their trade and diplomatic ties extended all the way to China and its Song Dynasty, which eventually determined the economic course of Egypt during the High Middle Ages. After the eighteenth Imam, al-Mustansir Billah, the Nizari sect believed that his son Nizar was his successor, while another Ismāʿīlī branch known as the Mustaali (from whom the Dawoodi Bohra would eventually descend), supported his other son, al-Musta'li. The Fatimid dynasty continued with al-Musta'li as both Imam and Caliph, and that joint position held until the 20th Imam, al-Amir bi-Ahkami l-Lah (1132). At the death of Imam Amir, one branch of the Mustaali faith claimed that he had transferred the imamate to his son at-Tayyib Abi l-Qasim, who was then two years old. After the decay of the Fatimid political system in the 1160s, the Zengid ruler Nūr ad-Dīn had his general, Shirkuh, seized Egypt from the vizier Shawar in 1169. Shirkuh died two months after taking power, and the rule went to his nephew, Saladin. This began the Ayyubid Sultanate of Egypt and Syria. Beginning in the 8th century, the Iberian Christian kingdoms had begun the Reconquista aimed at retaking Al-Andalus from the Moors. In 1095, Pope Urban II, inspired by the conquests in Spain by Christian forces and implored by the eastern Roman emperor to help defend Christianity in the East, called for the First Crusade from Western Europe which captured Edessa, Antioch, County of Tripoli and Jerusalem. In the early period of the Crusades, the Christian Kingdom of Jerusalem emerged and for a time controlled Jerusalem. The Kingdom of Jerusalem and other smaller Crusader kingdoms over the next 90 years formed part of the complicated politics of the Levant, but did not threaten the Islamic Caliphate nor other powers in the region. After Shirkuh ended Fatimid rule in 1169, uniting it with Syria, the Crusader kingdoms were faced with a threat, and his nephew Saladin reconquered most of the area in 1187, leaving the Crusaders holding a few ports. In the Third Crusade armies from Europe failed to recapture Jerusalem, though Crusader states lingered for several decades, and other crusades followed. The Christian Reconquista continued in Al-Andalus, and was eventually completed with the fall of Granada in 1492. During the low period of the Crusades, the Fourth Crusade was diverted from the Levant and instead took Constantinople, leaving the Eastern Roman Empire (now the Byzantine Empire) further weakened in their long struggle against the Turkish peoples to the east. However, the crusaders did manage to damage Islamic caliphates; according to William of Malmesbury, preventing them from further expansion into Christendom and being targets of the Mamluks and the Mongols. The Ayyubid dynasty was founded by Saladin and centered in Egypt. In 1174, Saladin proclaimed himself Sultan and conquered the Near East region. The Ayyubids ruled much of the Middle East during the 12th and 13th centuries, controlling Egypt, Syria, northern Mesopotamia, Hejaz, Yemen, and the North African coast up to the borders of modern-day Tunisia. After Saladin, his sons contested control over the sultanate, but Saladin's brother al-Adil eventually established himself in 1200. In the 1230s, Syria's Ayyubid rulers attempted to win independence from Egypt and remained divided until Egyptian Sultan as-Salih Ayyub restored Ayyubid unity by taking over most of Syria, excluding Aleppo, by 1247. In 1250, the dynasty in the Egyptian region was overthrown by slave regiments. A number of attempts to recover it failed, led by an-Nasir Yusuf of Aleppo. In 1260, the Mongols sacked Aleppo and wrested control of what remained of the Ayyubid territories soon after. After the Crusades the Mongols invaded in the 13th century, marking the end of the Islamic Golden Age. Some historians assert that the eastern Islamic world never fully recovered. Under the leadership of Genghis Khan, The Mongols put an end to the Abbasid era. The Mongol invasion of Central Asia began in 1219 at a huge cost in civilian life and economic devastation. The Mongols spread throughout Central Asia and Persia: the Persian city of Isfahan had fallen to them by 1237. With the election of Khan Mongke in 1251, The Mongols targeted the Abbasid capital, Baghdad. Mongke's brother, Hulegu, was made leader of the Mongol Army assigned to the task of subduing Baghdad. The fall of Bagdhad in 1258 destroyed what had been the largest city in Islam. The last Abbasid caliph, al-Musta'sim, was captured and killed; and Baghdad was ransacked and destroyed. The cities of Damascus and Aleppo fell in 1260. Plans for the conquest of Egypt were delayed due to the death of Mongke at around the same time. The Abbasid army lost to the superior Mongol army, but the invaders were finally stopped by Egyptian Mamluks north of Jerusalem in 1260 at the pivotal Battle of Ain Jalut. Goharshad Mosque built by the Timurid Empire. Ultimately, the Ilkhanate, Golden Horde, and the Chagatai Khanate - three of the four principal Mongol khanates - embraced Islam. In power in Syria, Mesopotamia, Persia and further east, over the rest of the 13th century gradually all converted to Islam. Most Ilkhanid rulers were replaced by the new Mongol power founded by Timur (himself a Muslim), who conquered Persia in the 1360s, and moved against the Delhi Sultanate in India and the Ottoman Turks in Anatolia. Timur's ceaseless conquests were accompanied by displays of brutality matched only by Chinggis Khan, whose example Timur consciously imitated. 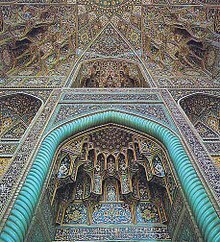 Samarqand, the cosmopolitan capital of Timur's empire, flourished under his rule as never before, while Iran and Iraq suffered large-scale devastation. The Middle East was still recovering from the Black Death, which may have killed one third of the population in the region. The plague began in China, and reached Alexandria in Egypt in 1347, spreading over the following years to most Islamic areas. The combination of the plague and the wars left the Middle Eastern Islamic world in a seriously weakened position. The Timurid dynasty would found many branches of Islam, including the Mughals of India. In 1250, the Ayyubid Egyptian dynasty was overthrown by slave regiments, and the Mamluk Sultanate was born. Military prestige was at the center of Mamluk society, and it played a key role in the confrontations with the Mongol forces. In the 1260s, the Mongols sacked and controlled the Islamic Near East territories. The Mamluks, who were Turkic, forced out the Mongols (see Battle of Ain Jalut) after the final destruction of the Ayyubid dynasty. The Mongols were again defeated by the Mamluks at the Battle of Hims a few months later, and then driven out of Syria altogether. With this, the Mamluks were able to concentrate their forces and to conquer the last of the crusader territories in the Levant. Thus they united Syria and Egypt for the longest interval between the Abbasid and Ottoman empires (1250–1517). The Mamluks experienced a continual state of political conflict, military tension, proxy wars, and economic competition between the "Muslim territory" (Dar al-Islam) and "non-Muslim territory" (Dar al-Harb). As part of their chosen role as defenders of Islamic orthodoxy, the Mamluks sponsored many religious buildings, including mosques, madrasas and khanqahs. Though some construction took place in the provinces, the vast bulk of these projects expanded the capital. Many Mamluk buildings in Cairo have survived to this day, particularly in Old Cairo. The interiors of the Alhambra in Granada, Spain decorated with arabesque designs. The Arabs, under the command of the Berber General Tarik ibn Ziyad, first began their conquest of southern Spain or al-Andalus in 711. A raiding party led by Tarik was sent to intervene in a civil war in the Visigothic kingdom in Hispania. Crossing the Strait of Gibraltar (named after the General), it won a decisive victory in the summer of 711 when the Visigothic king Roderic was defeated and killed on July 19 at the Battle of Guadalete. Tariq's commander, Musa bin Nusair crossed with substantial reinforcements, and by 718 the Muslims dominated most of the peninsula. Some later Arabic and Christian sources present an earlier raid by a certain Ṭārif in 710 and also, the Ad Sebastianum recension of the Chronicle of Alfonso III, refers to an Arab attack incited by Erwig during the reign of Wamba (672–80). The two large armies may have been in the south for a year before the decisive battle was fought. The rulers of Al-Andalus were granted the rank of Emir by the Umayyad Caliph Al-Walid I in Damascus. After the Abbasids came to power, some Umayyads fled to Muslim Spain to establish themselves there. By the end of the 10th century, the ruler Abd al-Rahman III took over the title of Caliph of Córdoba(912-961). Soon after, the Umayyads went on developing a strengthened state with its capital as Córdoba. Al-Hakam II succeeded to the Caliphate after the death of his father Abd ar-Rahman III in 961. He secured peace with the Christian kingdoms of northern Iberia, and made use of the stability to develop agriculture through the construction of irrigation works. Economic development was also encouraged through the widening of streets and the building of markets. The rule of the Caliphate is known as the heyday of Muslim presence in the peninsula. The Umayyad Caliphate collapsed in 1031 due to political divisions and civil unrest during the rule of Hicham II who was ousted because of his indolence. Al-Andalus then broke up into a number of states called taifa kingdoms (Arabic, Muluk al-ṭawā'if; English, Petty kingdoms). The decomposition of the Caliphate into those petty kingdoms weakened the Muslims in the Iberian Peninsula vis-à-vis the Christian kingdoms of the north. Some of the taifas, such as that of Seville, were forced to enter into alliances with Christian princes and pay tributes in money to Castille. Abd al-Rahman I and Bedr (a former Greek slave) escaped with their lives after the popular revolt known as the Abbasid Revolution. Rahman I continued south through Palestine, the Sinai, and then into Egypt. Rahman I was one of several surviving Umayyad family members to make a perilous trek to Ifriqiya at this time. Rahman I and Bedr reached modern day Morocco near Ceuta. 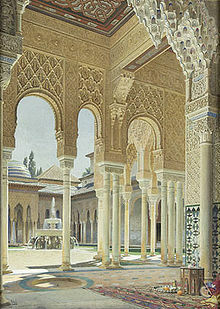 Next step would be to cross to sea to al-Andalus, where Rahman I could not have been sure whether he would be welcome. Following the Berber Revolt (740s), the province was in a state of confusion, with the Ummah torn by tribal dissensions among the Arabs and racial tensions between the Arabs and Berbers. Bedr lined up three Syrian commanders – Obeid Allah ibn Uthman and Abd Allah ibn Khalid, both originally of Damascus, and Yusuf ibn Bukht of Qinnasrin and contacted al-Sumayl (then in Zaragoza) to get his consent, but al-Sumayl refused, fearing Rahman I would try to make himself emir. After discussion with Yemenite commanders, Rahman I was told to go to al-Andalus. Shortly thereafter, he set off with Bedr and a small group of followers for Europe. Abd al-Rahman landed at Almuñécar in al-Andalus, to the east of Málaga. During his brief time in Málaga, he quickly amassed local support. News of the prince's arrival spread throughout the peninsula. In order to help speed his ascension to power, he took advantage of the feuds and dissensions. However, before anything could be done, trouble broke out in northern al-Andalus. Abd al-Rahman and his followers were able to control Zaragoza. Rahman I fought to rule al-Andalus in a battle at the Guadalquivir river, just outside Córdoba on the plains of Musarah (Battle of Musarah). Rahman I was victorious, chasing his enemies from the field with parts of their army. 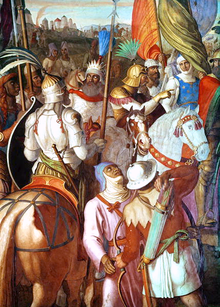 Rahman I marched into the capital, Córdoba, fighting off a counterattack, but negotiations ended the confrontation. After Rahman I consolidated power, he proclaimed himself the al-Andalus emir. Rahman I did not claim the Muslim caliph, though. The last step was to have al-Fihri's general, al-Sumayl, garroted in Córdoba's jail. Al-Andalus was a safe haven for the house of Umayya that managed to evade the Abbasids. In Baghdad, the Abbasid caliph al-Mansur had planned to depose the emir. Rahman I and his army confronted the Abbasids, killing most of the Abbasid army. The main Abbasid leaders were decapitated, their heads preserved in salt, with identifying tags pinned to their ears. The heads were bundled in a gruesome package and sent to the Abbasid caliph who was on pilgrimage at Mecca. Rahman I quelled repeated rebellions in al-Andalus. He began the building of the great mosque [cordova], and formed ship-yards along the coast; he is moreover said to have been the first to transplant the palm and the pomegranate into the congenial climate of Spain: and he encouraged science and literature in his states. He died on 29 September 788, after a reign of thirty-four years and one month. The exterior of the Mezquita. Rahman I's successor was his son Hisham I. Born in Córdoba, he built many mosques and completed the Mezquita. He called for a jihad that resulted in a campaign against the Kingdom of Asturias and the County of Toulouse; in this second campaign he was defeated at Orange by William of Gellone, first cousin to Charlemagne. His successor Al-Hakam I came to power and was challenged by his uncles, other sons of Rahman I. One, Abdallah, went to the court of Charlemagne in Aix-la-Chapelle to negotiate for aid. In the mean time Córdoba was attacked, but was defended. Hakam I spent much of his reign suppressing rebellions in Toledo, Saragossa and Mérida. Abd ar-Rahman II succeeded his father and engaged in nearly continuous warfare against Alfonso II of Asturias, whose southward advance he halted. Rahman II repulsed an assault by Vikings who had disembarked in Cádiz, conquered Seville (with the exception of its citadel) and attacked Córdoba. Thereafter he constructed a fleet and naval arsenal at Seville to repel future raids. He responded to William of Septimania's requests of assistance in his struggle against Charles the Bald's nominations. Muhammad I's reign was marked by the movements of the Muladi (ethnic Iberian Muslims) and Mozarabs (Muslim-Iberia Christians). Muhammad I was succeeded by his son Mundhir I. During the reign of his father, Mundhir I commanded military operations against the neighbouring Christian kingdoms and the Muladi rebellions. At his father's death, he inherited the throne. During his two-year reign, Mundhir I fought against Umar ibn Hafsun. He died in 888 at Bobastro, succeeded by his brother Abdullah ibn Muhammad al-Umawi. Umawi showed no reluctance to dispose of those he viewed as a threat. His government was marked by continuous wars between Arabs, Berbers and Muladi. His power as emir was confined to the area of Córdoba, while the rest had been seized by rebel families. The son he had designated as successor was killed by one of Umawi's brothers. The latter was in turn executed by Umawi's father, who named as successor Abd ar-Rahman III, son of the killed son of Umawi. The Umayyad conquest of North Africa continued the century of rapid Muslim military expansion following the death of Muhammad in 632. By 640 the Arabs controlled Mesopotamia, had invaded Armenia, and were concluding their conquest of Byzantine Syria. Damascus was the seat of the Umayyad caliphate. By the end of 641 all of Egypt was in Arab hands. A subsequent attempt to conquer the Nubian kingdom of Makuria was however repelled. The Great Mosque of Kairouan also known as the Mosque of Uqba was established in 670 by the Arab general and conqueror Uqba ibn Nafi, it is the oldest mosque in the Maghreb, situated in the city of Kairouan, Tunisia. Kairouan in Tunisia was the first city founded by Muslims in the Maghreb. 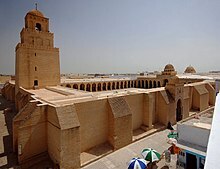 Arab general Uqba ibn Nafi erected the city (in 670) and, in the same time, the Great Mosque of Kairouan considered as the oldest and most prestigious sanctuary in the western Islamic world. This part of Islamic territory has had independent governments during most of Islamic history. The Idrisid were the first Arab rulers in the western Maghreb (Morocco), ruling from 788 to 985. The dynasty is named after its first sultan Idris I. The Almoravid dynasty was a Berber dynasty from the Sahara flourished over a wide area of North-Western Africa and the Iberian Peninsula during the 11th century. Under this dynasty the Moorish empire was extended over present-day Morocco, Western Sahara, Mauritania, Gibraltar, Tlemcen (in Algeria) and a part of what is now Senegal and Mali in the south, and Spain and Portugal in the north. The Almohad Dynasty or "the Unitarians", were a Berber Muslim religious power which founded the fifth Moorish dynasty in the 12th century, and conquered all Northern Africa as far as Egypt, together with Al-Andalus. Ruins of Zeila (Saylac), Somalia. The history of Islam in the Horn of Africa is almost as old as the faith itself. Through extensive trade and social interactions with their converted Muslim trading partners on the other side of the Red Sea, in the Arabian peninsula, merchants and sailors in the Horn region gradually came under the influence of the new religion. Early Islamic disciples fled to the port city of Zeila in modern-day northern Somalia to seek protection from the Quraysh at the court of the Aksumite Emperor in present-day Somalia. Some of the Muslims that were granted protection are said to have then settled in several parts of the Horn region to promote the religion. The victory of the Muslims over the Quraysh in the 7th century had a significant impact on local merchants and sailors, as their trading partners in Arabia had by then all adopted Islam, and the major trading routes in the Mediterranean and the Red Sea came under the sway of the Muslim Caliphs. Instability in the Arabian peninsula saw further migrations of early Muslim families to the Somali seaboard. These clans came to serve as catalysts, forwarding the faith to large parts of the Horn region. Islam came to the Great Lakes region of South Eastern Africa along existing trade routes. They learned from them the manners of the Muslims and this led to their conversion by the Muslim Arabs. Local Islamic governments centered in Tanzania (then Zanzibar). The people of Zayd were Muslims that immigrated to the Great Lakes region. In the pre-colonial period, the structure of Islamic authority here was held up through the Ulema (wanawyuonis, in Swahili language). These leaders had some degree of authority over most of the Muslims in South East Africa before territorial boundaries were established. The chief Qadi there was recognized for having the final religious authority. Islam first reached Maritime Southeast Asia through traders from Mecca in the 7th century, particularly via the western part of what is now Indonesia. Arab traders from Yemen already had a presence in Asia through trading and traveling by sea, serving as intermediary traders to and from Europe and Africa. They traded not only Arabian goods but also goods from Africa, India, and so on which included ivory, fragrances, spices, and gold. According to T.W. Arnold in The Preaching of Islam, by the 2nd century of the Islamic Calendar, Arab traders had been trading with the inhabitants of Ceylon, modern-day Sri Lanka. The same argument has been told by Dr. B.H. Burger and Dr. Mr. Prajudi in Sedjarah Ekonomis Sosiologis Indonesia (History of Socio Economic of Indonesia) According to an atlas created by the geographer Al-Biruni (973–1048), the Indian or Indonesian Ocean used to be called the Persian Ocean. After Western Imperialist rule, this name was changed to reflect the name used today; the Indian Ocean. Soon, many Sufi missionaries translated classical Sufi literature from Arabic and Persian into Malay; a tangible product of this is the Jawi script. Coupled with the composing of original Islamic literature in Malay, this led the way to the transformation of Malay into an Islamic language. By 1292, when Marco Polo visited Sumatra, most of the inhabitants had converted to Islam. The Sultanate of Malacca was founded on the Malay Peninsula by Parameswara, a Srivijayan Prince. Through trade and commerce, Islam then spread to Borneo and Java. By the late 15th century, Islam had been introduced to the Philippines via the southern island of Mindanao. The foremost socio-cultural Muslim entities that resulted form this are the present-day Sultanate of Sulu and Sultanate of Maguindanao; Islamised kingdoms in the northern Luzon island, such as the Kingdom of Maynila and the Kingdom of Tondo, were later conquered and Christianised with the majority of the archipelago by Spanish colonisers beginning in the 16th century. As Islam spread, societal changes developed from the individual conversions, and five centuries later it emerged as a dominant cultural and political power in the region. Three main Muslim political powers emerged. The Aceh Sultanate was the most important, controlling much of the area between Southeast Asia and India from its centre in northern Sumatra. The Sultanate also attracted Sufi poets. The second Muslim power was the Sultanate of Malacca on the Malay Peninsula. The Sultanate of Demak on Java was the third power, where the emerging Muslim forces defeated the local Majapahit kingdom in the early 16th century. Although the sultanate managed to expand its territory somewhat, its rule remained brief. Portuguese forces captured Malacca in 1511 under naval general Afonso de Albuquerque. With Malacca subdued, the Aceh Sultanate and Bruneian Empire established themselves as centres of Islam in Southeast Asia. The Sultanate's territory, although vastly diminished, remains intact to this day as the modern state of Brunei Darussalam. Qutub Minar is the world's tallest brick minaret, commenced by Qutb-ud-din Aybak of the Slave dynasty; 1st dynasty of the Delhi Sultanate. On the Indian subcontinent, Islam first appeared in the southwestern tip of the peninsula, in today's Kerala state. Arabs traded with Malabar even before the birth of Muhammad. Native legends say that a group of Sahaba, under Malik Ibn Deenar, arrived on the Malabar Coast and preached Islam. According to that legend, the first mosque of India was built by Second Chera King Cheraman Perumal, who accepted Islam and received the name Tajudheen. He traveled to Arabia to meet Muhammad and died on the trip back, somewhere in today's Oman. Historical records suggest that the Cheraman Perumal Mosque was built in around 629. Islamic rule came to the Indian subcontinent in the 8th century, when Muhammad bin Qasim conquered Sindh. Muslim conquests expanded under Mahmud and the Ghaznavids until the late 12th century, when the Ghurids overran the Ghaznavids and extended the conquests in Northern India. 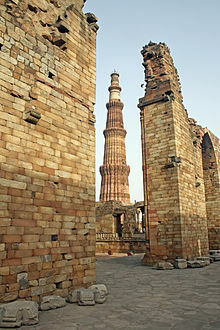 Qutb-ud-din Aybak conquered Delhi in 1206 and began the reign of the Delhi Sultanates. In the 14th century, Alauddin Khalji extended Muslim rule south to Gujarat, Rajasthan and Deccan. Various other Muslim dynasties also formed and ruled across India from the 13th to the 18th century such as the Qutb Shahi and the Bahmani, but none rivalled the power and extensive reach of the Mughal Empire at its peak. 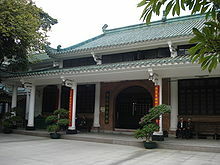 The Huaisheng Mosque of China, built by Sa`d ibn Abi Waqqas. In China, four Sahabas (Sa'ad ibn abi Waqqas, Wahb Abu Kabcha, Jafar ibn Abu Talib and Jahsh ibn Riyab) preached in 616/17 and onwards after following the Chittagong–Kamrup–Manipur route after sailing from Abyssinia in 615/16. 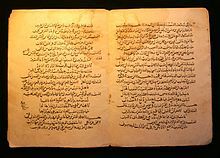 After conquering Persia in 636, Sa'ad ibn abi Waqqas went with Sa'id ibn Zaid, Qais ibn Sa'd and Hassan ibn Thabit to China in 637 taking the complete Quran. Sa'ad ibn abi Waqqas headed for China for the third time in 650–51 after Caliph Uthman asked him to lead an embassy to China, which the Chinese emperor received. In the 15th and 16th centuries three major Muslim empires formed: the Ottoman Empire in the Middle East, the Balkans and Northern Africa; the Safavid Empire in Greater Iran; and the Mughal Empire in South Asia. These imperial powers were made possible by the discovery and exploitation of gunpowder and more efficient administration. The Seljuq Turks declined in the second half of the 13th century, after the Mongol invasion. This resulted in the establishment of multiple Turkish principalities, known as beyliks. Osman I, the founder of the Ottoman dynasty, assumed leadership of one of these principalities (Söğüt) at the end of the thirteenth century, succeeding his father Ertuğrul. Osman I afterwards led it in a series of battles with the Byzantine Empire. By 1331, the Ottomans had captured Nicaea, the former Byzantine capital, under the leadership of Osman's son and successor, Orhan I. Victory at the Battle of Kosovo against the Serbs in 1389 then facilitated their expansion into Europe. The Ottomans were established in the Balkans and Anatolia by the time Bayezid I ascended to power in the same year, now at the helm of a growing empire. Growth halted when Mongol warlord Timur (also known as "Tamerlane") captured Bayezid I in the Battle of Ankara in 1402, beginning the Ottoman Interregnum. This episode was characterized by the division of the Ottoman territory amongst Bayezid I's sons, who submitted to Timurid authority. When a number of Ottoman territories regained independent status, ruin for the Empire loomed. However, the empire recovered, as the youngest son of Bayezid I, Mehmed I, waged offensive campaigns against his ruling brothers, thereby reuniting Asia Minor and declaring himself sultan in 1413. The Suleiman Mosque (Süleymaniye Camii) in Istanbul was built on the order of sultan Suleiman the Magnificent by the Ottoman architect Mimar Sinan in 1557. Around this time the Ottoman naval fleet developed, such that they were able to challenge Venice, a naval power. They also attempted to reconquer the Balkans. By the time of Mehmed I's grandson, Mehmed II (ruled 1444–1446; 1451–1481), the Ottomans could lay siege to Constantinople, the capital of Byzantium. A factor in this siege was the use of muskets and large cannons introduced by the Ottomans. The Byzantine fortress succumbed in 1453, after 54 days of siege. Without its capital the Byzantine Empire disintegrated. The future successes of the Ottomans and later empires would depend upon the exploitation of gunpowder. In the early 16th century, the Shi'ite Safavid dynasty assumed control in Persia under the leadership of Shah Ismail I, defeating the ruling Turcoman federation Aq Qoyunlu (also called the "White Sheep Turkomans") in 1501. The Ottoman sultan Selim I sought to repel Safavid expansion, challenging and defeating them at the Battle of Chaldiran in 1514. Selim I also deposed the ruling Mamluks in Egypt, absorbing their territories in 1517. Suleiman I (also known as Suleiman the Magnificent), Selim I's successor, took advantage of the diversion of Safavid focus to the Uzbeks on the eastern frontier and recaptured Baghdad, which had fallen under Safavid control. Despite this, Safavid power remained substantial, rivalling the Ottomans. Suleiman I advanced deep into Hungary following the Battle of Mohács in 1526 — reaching as far as the gates of Vienna thereafter, and signed a Franco-Ottoman alliance with Francis I of France against Charles V of the Holy Roman Empire 10 years later. While Suleiman I's rule (1520–1566) is often identified as the apex of Ottoman power, the empire continued to remain powerful and influential until a relative fall in its military strength in the second half of the eighteenth century. The Safavid dynasty rose to power in Tabriz in 1501 and later conquered the rest of Iran. They were of mixed ancestry, originally Kurdish, but during their rule intermarried with Turkomans, Georgians, Circassians, and Pontic Greeks.The Safavids were originally Sufi and Iran was Sunni. After their defeat at the hands of the Sunni Ottomans at the Battle of Chaldiran, to unite the Persians behind him, Ismail I made conversion mandatory for the largely Sunni population to Twelver Shia so that he could get them to fight the Sunni Ottomans. This resulted in the Safavid conversion of Iran to Shia Islam. Zaydis, the largest group amongst the Shia before the Safavid Dynasty were also forced to convert to the Twelver Shia. The Zaydis at that time used the Hanafi Fiqh, as did most Sunnis and there were good relations between them. Abu Hanifah and Zayd ibn Ali were also very good friends. The Safavids dynasty from Azarbaijan ruled from 1501 to 1736, and which established Twelver Shi'a Islam as the region's official religion and united its provinces under a single sovereignty, thereby reigniting the Persian identity. Although claiming to be the descendants of Ali ibn Abu Talib, the Safavids were Sunni (the name "Safavid" comes from a Sufi order called Safavi). Their origins go back to Firuz Shah Zarrinkolah, a local dignitary from the north. During their rule, the Safavids recognized Twelver Shi'a Islam as the State religion, thus giving the region a separate identity from its Sunni neighbours. In 1524, Tahmasp I acceded to the throne, initiating a revival of the arts. Carpetmaking became a major industry. The tradition of Persian miniature painting in manuscripts reached its peak, until Tahmasp turned to strict religious observance in middle age, prohibiting the consumption of alcohol and hashish and removing casinos, taverns and brothels. Tahmasp's nephew Ibrahim Mirza continued to patronize a last flowering of the arts until he was murdered, after which many artists were recruited by the Mughal dynasty. Tahmasp's grandson, Shah Abbas I, restored the shrine of the eighth Twelver Shi'a Imam, Ali al-Ridha at Mashhad, and restored the dynastic shrine at Ardabil. Both shrines received jewelry, fine manuscripts and Chinese porcelains. Abbas moved the capital to Isfahan, revived old ports, and established thriving trade with Europeans. Amongst Abbas's most visible cultural achievements was the construction of Naqsh-e Jahan Square ("Design of the World"). The plaza, located near a Friday mosque, covered 20 acres (81,000 m2). The Safavid Dynasty was toppled in 1722 by the Hotaki dynasty, which ended their forceful conversion of Sunni areas to Shiaism. The Mughal Empire at its greatest extent, in ca. 1700 CE. Taj Mahal is a mausoleum built by Mughal Emperor Shah Jahan to house the tomb of his favorite wife, Mumtaz Mahal. Mughal Empire was a power in the Indian subcontinent, founded in 1526. It was established and ruled by the Timurid dynasty, with Turco-Mongol Chagatai roots from Central Asia, claiming direct descent from both Genghis Khan (through his son Chagatai Khan) and Timur, and with significant Indian Rajput and Persian ancestry through marriage alliances; the first two Mughal emperors had both parents of Central Asian ancestry, while successive emperors were of predominantly Rajput and Persian ancestry. The dynasty was Indo-Persian in culture, combining Persianate culture with local Indian cultural influences visible in its court culture and administrative customs. The modern age brought technological and organizational changes to Europe while the Islamic region continued the patterns of earlier centuries. The European powers, and especially Britain and France, globalized economically and colonized much of the region. By the end of the 19th century, the Ottoman Empire had declined. The decision to back Germany in World War I meant they shared the Central Powers' defeat in that war. 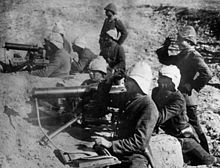 The defeat led to the overthrow of the Ottomans by Turkish nationalists led by the victorious general of the Battle of Gallipoli: Mustafa Kemal, who became known to his people as Atatürk, "Father of the Turks." Atatürk was credited with renegotiating the treaty of Sèvres (1920) which ended Turkey's involvement in the war and establishing the modern Republic of Turkey, which was recognized by the Allies in the Treaty of Lausanne (1923). Atatürk went on to implement an ambitious program of modernization that emphasized economic development and secularization. He transformed Turkish culture to reflect European laws, adopted Arabic numerals, the Latin script, separated the religious establishment from the state, and emancipated woman—even giving them the right to vote in parallel with women's suffrage in the west. Following World War I, the vast majority of former Ottoman territory outside of Asia Minor was handed over to the victorious European powers as protectorates. During the war the Allies had promised the subject peoples independence in exchange for their assistance fighting the Turkish powers. To their dismay, they found that this system of "protectorates" was a smoke-screen for their continued subjugation by the British and the French. The struggles for independence from their Turkish overlords and the cooperation of partisan forces with the British were romanticized in the stories of British secret intelligence agent T. E. Lawrence—later known as "Lawrence of Arabia." Ottoman successor states include today's Albania, Bosnia and Herzegovina, Bulgaria, Egypt, Greece, Iraq, Israel, Lebanon, Romania, Saudi Arabia, Serbia, Syria, Jordan, Turkey, Balkan states, North Africa and the north shore of the Black Sea. Many Muslim countries sought to adopt European political organization and nationalism began to emerge in the Muslim world. Countries like Egypt, Syria and Turkey organized their governments and sought to develop national pride among their citizens. Other places, like Iraq, were not as successful due to a lack of unity and an inability to resolve age-old prejudices between Muslim sects and against non-Muslims. Some Muslim countries, such as Turkey and Egypt, sought to separate Islam from the secular government. In other cases, such as Saudi Arabia, the government brought out religious expression in the re-emergence of the puritanical form of Sunni Islam known to its detractors as Wahabism, which found its way into the Saudi royal family. The Arab–Israeli conflict spans about a century of political tensions and open hostilities. It involves the establishment of the modern State of Israel as a Jewish nation state, the consequent displacement of the Palestinian people and Jewish exodus from Arab and Muslim countries, as well as the adverse relationship between the Arab states and the State of Israel (see related Israeli–Palestinian conflict). Despite at first involving only the Arab states bordering Israel, animosity has also developed between Israel and other predominantly Muslim states. The Six-Day War of June 5–10, 1967, was fought between Israel and the neighbouring states of Egypt, Jordan, and Syria. The Arab countries closed the Suez canal and it was followed in May 1970 by the closure of the "tapline" from Saudi Arabia through Syria to Lebanon. These developments had the effect of increasing the importance of petroleum in Libya, which is a short (and canal-free) shipping distance from Europe. In 1970, Occidental Petroleum broke with other oil companies and accepted the Arab demands for price increases. Many countries, individuals and non-governmental organizations elsewhere in the world feel involved in this conflict for reasons such as cultural and religious ties with Islam, Arab culture, Christianity, Judaism, Jewish culture, or for ideological, human rights, or strategic reasons. Although some consider the Arab–Israeli conflict a part of (or a precursor to) a wider clash of civilizations between the Western World and the Muslim world, others oppose this view. Animosity emanating from this conflict has caused numerous attacks on supporters (or perceived supporters) of each side by supporters of the other side in many countries around the world. In 1979 the Iranian Revolution transformed Iran from a constitutional monarchy to a populist theocratic Islamic republic under the rule of Ayatollah Ruhollah Khomeini, a Shi'i Muslim cleric and marja. Following the Revolution, and a new constitution was approved and a referendum established the government, electing Ruhollah Khomeini as Supreme Leader. During the following two years, liberals, leftists, and Islamic groups fought each other, and the Islamics captured power. The development of the two opposite fringes, the Safavid conversion of Iran to Shia Islam the Twelver Shia version and its reinforcement by the Iranian Revolution and the Salafi in Saudi Arabia, coupled with the Iran–Saudi Arabia relations resulted in these governments using sectarian conflict to enhance their political interests. Gulf states such as Saudi Arabia and Kuwait (despite being hostile to Iraq) encouraged Saddam Hussein to invade Iran, which resulted in the Iran–Iraq War, as they feared that an Islamic revolution would take place within their own borders. Certain Iranian exiles also helped convince Saddam that if he invaded, the fledgling Islamic republic would quickly collapse. In October 1973, a new war between Israel and its Muslim neighbors, known as the Yom Kippur War, broke out just as the oil companies began meeting with OPEC leaders. OPEC had been emboldened by the success of Sadat's campaigns and the war strengthened their unity. In response to the emergency resupply effort by the West that enabled Israel to put up a resistance against the Egyptian and Syrian forces, the Arab world imposed the 1973 oil embargo against the United States and Western Europe. Faisal agreed that Saudi Arabia would use some of its oil wealth to finance the "front-line states", those that bordered Israel, in their struggle. The centrality of petroleum, the Arab-Israeli Conflict and political and economic instability and uncertainty remain constant features of the politics of the region. ^ Islam Q & A, Doubts about the Sahaabah (may Allah be pleased with them) and a response to those doubts, retrieved on 24 December 2018. "...Ibn Khaldoon: How often the historians, mufassireen, and narrators of reports make mistakes in the stories they narrate, because their method is mere transmission of reports, whether sound or unsound, without examining these reports and their chains of narration, and comparing them to other, similar reports, and without examining them in the light of reason and in the light of human nature. Thus they drifted away from the path of truth and fell into grievous mistakes and errors." ^ Watt, William Montgomery (2003). Islam and the Integration of Society. Psychology Press. p. 5. ISBN 978-0-415-17587-6. ^ a b "Key themes in these early recitations include the idea of the moral responsibility of man who was created by God and the idea of the judgment to take place on the day of resurrection. [...] Another major theme of Muhammad's early preaching, [... is that] there is a power greater than man's, and that the wise will acknowledge this power and cease their greed and suppression of the poor." F. Buhl & A.T. Welch, Encyclopaedia of Islam 2nd ed., "Muhammad", vol. 7, p. 363. ^ a b "At first Muhammad met with no serious opposition [...] He was only gradually led to attack on principle the gods of Mecca. [...] Meccan merchants then discovered that a religious revolution might be dangerous to their fairs and their trade." F. Buhl & A.T. Welch, Encyclopaedia of Islam 2nd ed., "Muhammad", vol. 7, p. 364. ^ Donner 2010, p. 628. ^ Robinson 2010, p. 6. ^ Robinson 2010, p. 2. ^ Hughes 2013, p. 56. ^ a b Donner 2010, p. 633. ^ See also Hughes 2013, pp. 6 & 7, who links the practice of source and tradition (or form) criticism as one approach. ^ Donner 2010, pp. 629, 633. ^ Donner 2010, p. 630. ^ Donner 2010, p. 631. ^ Donner 2010, p. 632. ^ a b c Robinson 2010, p. 9. ^ Robinson 2010, pp. 4, 5. ^ Christian Julien Robin (2012). Arabia and Ethiopia. In The Oxford Handbook of Late Antiquity. OUP USA. pp. 297–99. ISBN 9780195336931. ^ a b c d Christian Julien Robin (2012). Arabia and Ethiopia. In The Oxford Handbook of Late Antiquity. OUP USA. p. 302. ISBN 9780195336931. ^ Christian Julien Robin (2012). Arabia and Ethiopia. In The Oxford Handbook of Late Antiquity. OUP USA. p. 287. ISBN 9780195336931. ^ a b Christian Julien Robin (2012). Arabia and Ethiopia. In The Oxford Handbook of Late Antiquity. OUP USA. p. 301. ISBN 9780195336931. ^ Irving M. Zeitlin (19 March 2007). The Historical Muhammad. Polity. p. 49. ISBN 978-0-7456-3999-4. ^ "The very first question a biographer has to ask, namely when the person was born, cannot be answered precisely for Muhammad. [...] Muhammad's biographers usually make him 40 or sometimes 43 years old at the time of his call to be a prophet, which [...] would put the year of his birth at about 570 A.D." F. Buhl & A.T. Welch, Encyclopaedia of Islam 2nd ed., "Muhammad", vol. 7, p. 361. ^ Robinson 2010, p. 187. ^ a b c d e Albert Hourani (2002). A History of the Arab Peoples. Harvard University Press. pp. 15–19. ISBN 9780674010178. ^ W. Montgomery Watt (1956). Muhammad At Medina. Oxford At The Clarendon Press. pp. 1–17, 192–221. ^ a b c Albert Hourani (2002). A History of the Arab Peoples. Harvard University Press. pp. 22–23. ISBN 9780674010178. ^ Abdul Basit Ahmad (2001). Umar bin Al Khattab - The Second Caliph of Islam. Darussalam. p. 43. ISBN 978-9960-861-08-1. ^ Khalid Muhammad Khalid; Muhammad Khali Khalid (2005). Men Around the Messenger. The Other Press. pp. 20–. ISBN 978-983-9154-73-3. ^ Maulana Muhammad Ali (8 August 2011). The Living Thoughts of the Prophet Muhammad. eBookIt.com. pp. 132–. ISBN 978-1-934271-22-3. ^ Muhammad Al-Buraey (1985). Administrative Development: An Islamic Perspective. KPI. pp. 254–. ISBN 978-0-7103-0333-2. ^ Muhammad Al-Buraey (1985). Administrative Development: An Islamic Perspective. KPI. pp. 252–. ISBN 978-0-7103-0059-1. ^ Ahmed Akgündüz; Said Öztürk (1 January 2011). Ottoman History: Misperceptions and Truths. IUR Press. pp. 539–. ISBN 978-90-90-26108-9. ^ a b Sami Ayad Hanna; George H. Gardner (1969). Arab Socialism. [al-Ishtirakīyah Al-ʻArabīyah]: A Documentary Survey. Brill Archive. pp. 271–. GGKEY:EDBBNXAKPQ2. ^ R. B. Serjeant (1978). "Sunnah Jami'ah, pacts with the Yathrib Jews, and the Tahrim of Yathrib: analysis and translation of the documents comprised in the so-called 'Constitution of Medina'". Bulletin of the School of Oriental and African Studies. 41: 1–42. doi:10.1017/S0041977X00057761. ^ R. B. Serjeant (1964). "The Constitution of Medina". Islamic Quarterly. 8: 4. ^ Wilferd Madelung (15 October 1998). The Succession to Muhammad: A Study of the Early Caliphate. Cambridge University Press. p. 61. ISBN 978-0-521-64696-3. ^ Archibald Ross Lewis (1985). European Naval and Maritime History, 300–1500. Indiana University Press. pp. 24–. ISBN 978-0-253-32082-7. ^ Leonard Michael Kroll (2005). History of the Jihad: Islam Versus Civilization. AuthorHouse. pp. 123–. ISBN 978-1-4634-5730-3. ^ Timothy E. Gregory (26 August 2011). A History of Byzantium. John Wiley & Sons. pp. 183–. ISBN 978-1-4443-5997-8. ^ Mark Weston (28 July 2008). Prophets and Princes: Saudi Arabia from Muhammad to the Present. John Wiley & Sons. pp. 61–. ISBN 978-0-470-18257-4. ^ Khalid Muhammad Khalid; Muhammad Khali Khalid (February 2005). Men Around the Messenger. The Other Press. pp. 117–. ISBN 978-983-9154-73-3. ^ P. M. Holt; Peter Malcolm Holt; Ann K. S. Lambton; Bernard Lewis (1977). The Cambridge History of Islam:. Cambridge University Press. pp. 605–. ISBN 978-0-521-29138-5. ^ Maulana Muhammad Ali (9 August 2011). The Early Caliphate. eBookIt.com. pp. 101–. ISBN 978-1-934271-25-4. ^ Schimmel, Annemarie; Barbar Rivolta (Summer, 1992). "Islamic Calligraphy". The Metropolitan Museum of Art Bulletin, New Series 50 (1): 3. ^ Wilferd Madelung (1998). The Succession to Muhammad: A Study of the Early Caliphate. Cambridge University Press. p. 232. ISBN 978-0-521-64696-3. ^ Bukhari, Sahih. "Sahih Bukhari : Book of "Peacemaking"". ^ Dermenghem, E. (1958). Muhammad and the Islamic tradition. New York: Harper Brothers. p. 183. ^ The Succession to Muhammad: A Study of the Early Caliphate by Wilferd Madelung. p. 340. ^ Kokab wa Rifi Fazal-e-Ali Karam Allah Wajhu, Page 484, by Syed Mohammed Subh-e-Kashaf AlTirmidhi, Urdu translation by Syed Sharif Hussein Sherwani Sabzawari, Published by Aloom AlMuhammed, number B12 Shadbagh, Lahore, 1 January 1963. p. 484. ^ In the Al-Andalus (the Iberian Peninsula), North Africa and in the east populations revolted. In A.H. 102 (720–721) in Ifriqiyah, the harsh governor Yazid ibn Muslim was overthrown and Muhammad ibn Yazid, the former governor, restored to power. The caliph accepted this and confirmed Muhammad ibn Yazid as governor of Ifriqiyah. ^ *Eggenberger, David (1985). An Encyclopedia of Battles: Accounts of Over 1,560 Battles from 1479 BC. to the Present. Courier Dover Publications. ISBN 0-486-24913-1 p. 3. ^ von Ess, "Kadar", Encyclopaedia of Islam 2nd Ed. ^ a b c d e f g Applied History Research Group. "The Islamic World to 1600". University of Calagary. Archived from the original on 10 April 2007. Retrieved 18 April 2007. ^ Abdel Wahab El Messeri. Episode 21: Ibn Rushd, Everything you wanted to know about Islam but was afraid to Ask, Philosophia Islamica. ^ Fauzi M. Najjar (Spring, 1996). The debate on Islam and secularism in Egypt, Arab Studies Quarterly (ASQ). ^ Chamber's Encyclopaedia: A Dictionary of Universal Knowledge, Volume 5. W. & R. Chambers, 1890. p. 567. ^ Johannes P. Schadé (ed.). Encyclopedia of World Religions. ^ Thomas Spencer Baynes (1878). The Encyclopædia Britannica: a dictionary of arts, sciences, and general literature. A. and C. Black. pp. 578–. ^ Hindu rebellions in Sindh were put down, and most of Afghanistan was absorbed with the surrender of the leader of Kabul. Mountainous regions of Iran were brought under a tighter grip of the central Abbasid government, as were areas of Turkestan. There were disturbances in Iraq during the first several years of Al-Ma'mun's reign. Egypt continued to be unquiet. Sindh was rebellious, but Ghassan ibn Abbad subdued it. An ongoing problem for Al-Ma'mun was the uprising headed by Babak Khorramdin. In 214 Babak routed a Caliphate army, killing its commander Muhammad ibn Humayd. ^ The Mihna subjected traditionalist scholars with social influence and intellectual quality to imprisonment, religious tests, and loyalty oaths. Al-Ma'mun introduced the Mihna with the intention to centralize religious power in the caliphal institution and test the loyalty of his subjects. The Mihna had to be undergone by elites, scholars, judges and other government officials, and consisted of a series of questions relating to theology and faith. The central question was about the state of the creation of the Qur'an: if the person interrogated stated he believed the Qur'an to be created, he was free to leave and continue his profession. ^ Had he been victorious over the Byzantine Emperor, Al-Ma'mun would have made a condition of peace be that the emperor hand over of a copy of the "Almagest". ^ Its minarets were spiraling cones 55 metres (180 ft) high with a spiral ramp, and it had 17 aisles with walls paneled with mosaics of dark blue glass. ^ A sum of 120,000 golden pieces was paid for the freedom of the captives. ^ Examples of the former include the loss of Mosul in 990, and the loss of Ṭabaristān and Gurgān in 997. An example of the latter is the Kakūyid dynasty of Isfahān, whose fortunes rose with the decline of the Būyids of northern Iran. ^ Bowen, Harold (1928). The Life and Times of ʿAlí Ibn ʿÍsà: The Good Vizier. Cambridge University Press. p. 385. ^ Hanne, Eric, J. (2007). Putting the Caliph in His Place: Power, Authority, and the Late Abbasid Caliphate. Fairleigh Dickinson Univ Press. p. 55. ISBN 9780838641132. ^ William Muir. The Caliphate: Its Rise, Decline, and Fall. ^ Jonathan Riley-Smith, The Oxford History of the Crusades, (Oxford University Press, 2002), 213. ^ William Muir, The Caliphate: Its Rise, Decline, and Fall. ^ ʻIzz al-Dīn Ibn al-Athīr, Donald Sidney Richards, The chronicle of Ibn al-Athīr for the crusading period from al-Kāmil fī'l-ta'rīkh: The years 491–541/1097–1146 : the coming of the Franks and the Muslim response. ^ Martin Sicker (2000). The Islamic World in Ascendancy: From the Arab Conquests to the Siege of Vienna. Greenwood Publishing Group. ISBN 978-0-275-96892-2. ^ Jean Richard, The Latin kingdom of Jerusalem: Volume 1. 1979. p. 36. ^ It is supposed by an emissary of the Hashshashins, who had no love for the Caliph. Modern historians have suspected that Mas'ud instigated the murder although the two most important historians of the period Ibn al-Athir and Ibn al-Jawzi did not speculate on this matter. ^ William Muir. book The Caliphate: Its Rise, Decline, and Fall, 1924. ^ Bernard Lewis (1991). The Political Language of Islam. University of Chicago Press. ^ Ann K. S. Lambton (1981). State and Government in Medieval Islam: An Introduction to the Study of Islamic Political Theory : the Jurists. Psychology Press. pp. 138–. ISBN 978-0-19-713600-3. ^ Arthur Goldschmidt, Jr. A Concise History of the Middle East. ^ a b Mahmoud A. El-Gamal (2006). Islamic Finance: Law, Economics, and Practice. Cambridge University Press. pp. 122–. ISBN 978-1-139-45716-3. ^ a b T Spencer C. Tucker; Priscilla Roberts (2008). The Encyclopedia of the Arab-Israeli Conflict: A Political, Social, and Military History [4 volumes]: A Political, Social, and Military History. ABC-CLIO. pp. 917–. ISBN 978-1-85109-842-2. ^ a b The Iraq Effect: The Middle East After the Iraq War. Rand Corporation. 2010. pp. 91–. ISBN 978-0-8330-4788-5. ^ "Mahdia: Historical Background Archived 2013-11-09 at the Wayback Machine". Commune-mahdia.gov.tn. ^ a b Beeson, Irene (September – October 1969). "Cairo, a Millennial". Saudi Aramco World: 24, 26–30. Archived from the original on 30 September 2007. Retrieved 9 August 2007. ^ Henry Melvill Gwatkin; James Pounder Whitney; Joseph Robson Tanner; Charles William Previté-Orton; Zachary Nugent Brooke (1913). The Cambridge Medieval History. Macmillan. pp. 379–. ^ Amin Maalouf (1984). The Crusades Through Arab Eyes. Al Saqi Books. pp. 160–70. ISBN 978-0-8052-0898-6. ^ Henry Hallam (1870). View of the State of Europe During the Middle Ages. 1. W. J. Widdleton. pp. 49–. ^ The Literary Era: A Monthly Repository of Literary and Miscellaneous Information. 5. Porter & Coates. 1898. pp. 133–. ^ Sylvia Schein (2005). Gateway to the Heavenly City: Crusader Jerusalem and the Catholic West (1099–1187). Ashgate. pp. 19–. ISBN 978-0-7546-0649-9. ^ Peter Lock (2013). The Routledge Companion to the Crusades. Routledge. pp. 180–. ISBN 978-1-135-13137-1. ^ Tschanz, David W. (July/August 2007). "History's Hinge: 'Ain Jalut". Saudi Aramco World. ^ a b "Tamerlane, or Timur". Medieval Islamic Civilization: An Encyclopedia. Routledge. 2014. While Timur's capital, Samarqand, became a cosmopolitan imperial city that flourished as never before, Iran and Iraq suffered devastation at a greater degree than that caused by the Mongols. [...] Timur's conquests also consciously aimed to restore the Mongol Empire, and the deliberate devastation that accompanied them was a conscious imitation of the Mongol onslaught. S. Starr, S. Frederick (2014). Lost Enlightenment: Central Asia's Golden Age from the Arab Conquest to Tamerlane. HarperCollins Publishers India. p. 411. ISBN 9789351361862. Timur's ceaseless conquests were accompanied by a level of brutality matched only by Chinggis Khan himself. At Isfahan his troops dispatched some 70,000 defenders, while at Delhi his soldiers are reported to have systematically killed 100,000 Indians. ^ Richards, John F. (1996). The Mughal Empire. Cambridge University Press. ^ The Encyclopaedia of Islam. New Edition. Brill, Leiden. ^ For more, see Mamluk architecture. ^ Glubb, John Bagot (1966). The course of empire: The Arabs and their successors. Prentice-Hall. p. 128. ^ Glick, Thomas F. (2005). Islamic and Christian Spain in the early Middle Ages. BRILL. p. 102. ISBN 978-90-04-14771-3. ^ Luscombe, David Edward; Jonathan Riley-Smith (2004). The new Cambridge medieval history. Cambridge University Press. p. 599. ISBN 978-0-521-41410-4. ^ O'Callaghan, Joseph F. (1983). A History of Medieval Spain. Cornell University Press. p. 133. ISBN 978-0-8014-9264-8. ^ Constable, Olivia Remie (1997). "The Political Dilemma of a Granadan Ruler". Medieval Iberia: Readings from Christian, Muslim, and Jewish Sources. University of Pennsylvania Press. p. 103. ISBN 978-0-8122-1569-4. ^ This was likely because al-Andalus was a land besieged by many different loyalties, and the proclamation of caliph would have likely caused much unrest. Abd al-Rahman's progeny would, however, take up the title of caliph. ^ Michael Hamilton Morgan. Lost History: The Enduring Legacy of Muslim Scientists, Thinkers, and Artists. National Geographic Books, 2008. ^ The Penny Cyclopædia of the Society for the Diffusion of Useful Knowledge. 15–16. C. Knight. 1839. pp. 385–. ^ P P. M. Holt; Peter Malcolm Holt; Ann K. S. Lambton; Bernard Lewis (21 April 1977). The Cambridge History of Islam:. Cambridge University Press. pp. 411–. ISBN 978-0-521-29137-8. ^ Chisholm, Hugh, ed. (1911). Encyclopædia Britannica (11th ed.). Cambridge University Press. ^ Fierro, Maribel (2005). Abd-al-Rahman III of Córdoba. Oxford: Oneworld Publications. ISBN 978-1-85168-384-0. ^ Ibn Idhari (1860) [Composed c. 1312]. Al-Bayan al-Mughrib [Historias de Al-Andalus] (in Spanish). Volume 1. trans. Francisco Fernández y González. Granada: Francisco Ventura y Sabatel. OCLC 557028856. ^ Lane-Poole, Stanley (1894). The Mohammedan Dynasties: Chronological and Genealogical Tables with Historical Introductions. Westminster: Archibald Constable and Company. OCLC 1199708. ^ "Kairouan Capital of Political Power and Learning in the Ifriqiya". Muslim Heritage. ^ Clifford Edmund Bosworth (2007). Historic Cities of the Islamic World. BRILL. pp. 264–. ISBN 978-90-04-15388-2. ^ Y. Benhima, "The Idrisids (789–974) Archived 10 June 2013 at the Wayback Machine". qantara-med.org, 2008. Chisholm, Hugh, ed. (1911). "Almoravides" . Encyclopædia Britannica (11th ed.). Cambridge University Press. ^ History of the Almonades, Reinhart Dozy, Second edition, 1881. ^ Nimtz, Jr., August H. (1980). Islam and Politics in East Aftrica. the Sufi Order in Tanzania. Minneapolis: University of Minnesota Press. ^ Gustave Le Bon. (1956). Hadarat al Arab. Translation of La Civilisation-des Arabes. 3rd Print. Cairo. p. 95. ^ Sir Thomas Arnold and Alfred Guilaume, (eds. ), (1965). The Legacy of Islam. Oxford University Press, New York, p. 87. ^ Spencer Tucker (2009). The Encyclopedia of the Spanish-American and Philippine-American Wars: A Political, Social, and Military History. 1. ABC-CLIO. pp. 419–. ISBN 978-1-85109-951-1. ^ "World's second oldest mosque is in India". Bahrain tribune. Archived from the original on 6 July 2006. Retrieved 9 August 2006. ^ Srivastava, Ashirvadi Lal (1929). The Sultanate Of Delhi 711–1526 AD. Shiva Lal Agarwala & Company. ^ Holden, Edward Singleton (1895). The Mogul emperors of Hindustan, A.D. 1398 – A.D. 1707. New York : C. Scribner's Sons. ^ Khamouch, Mohammed. "Jewel of Chinese Muslim’s Heritage". FTSC. ^ Kohn, G. C. (2006). Dictionary of wars. New York: Facts on File. p. 94. ^ Ágoston, Gábor (2009). "Introduction". In Ágoston, Gábor; Bruce Masters (eds.). Encyclopedia of the Ottoman Empire. p. xxxii. Faroqhi, Suraiya (1994). "Crisis and Change, 1590–1699". In İnalcık, Halil; Donald Quataert (eds.). An Economic and Social History of the Ottoman Empire, 1300–1914. 2. Cambridge University Press. p. 553. ISBN 978-0-521-57456-3. In the past fifty years, scholars have frequently tended to view this decreasing participation of the sultan in political life as evidence for “Ottoman decadence,” which supposedly began at some time during the second half of the sixteenth century. But recently, more note has been taken of the fact that the Ottoman Empire was still a formidable military and political power throughout the seventeenth century, and that noticeable though limited economic recovery followed the crisis of the years around 1600; after the crisis of the 1683–99 war, there followed a longer and more decisive economic upswing. Major evidence of decline was not visible before the second half of the eighteenth century. ^ a b "Indo-Persian Literature Conference: SOAS: North Indian Literary Culture (1450–1650)". SOAS. Retrieved 28 November 2012. ^ Cite error: The named reference persianatemogul was invoked but never defined (see the help page). ^ Cite error: The named reference borocz was invoked but never defined (see the help page). ^ Cite error: The named reference Taagepera was invoked but never defined (see the help page). ^ Cite error: The named reference voss was invoked but never defined (see the help page). ^ Cite error: The named reference Parthasarathi was invoked but never defined (see the help page). ^ Cite error: The named reference Williamson was invoked but never defined (see the help page). ^ Cite error: The named reference eraly was invoked but never defined (see the help page). ^ Cite error: The named reference Hodgson was invoked but never defined (see the help page). ^ Heather S. Gregg; Hy S. Rothstein; John Arquilla (2010). The Three Circles of War: Understanding the Dynamics of Conflict in Iraq. Potomac Books, Inc. pp. 66–. ISBN 978-1-59797-499-8. ^ Said Amir Arjomand (2009). After Khomeini: Iran Under His Successors. Oxford University Press. pp. 195–. ISBN 978-0-19-974576-0. Armstrong, Karen (2000). Islam: A Short History. Modern Library. ISBN 978-0-679-64040-0. Berkey, Jonathan Porter (2003). The Formation of Islam: Religion and Society in the Near East, 600–1800. Cambridge University Press. Bloom; Blair (2000). Islam:A Thousand Years of Faith and Power. Esposito, John (2000). Oxford History of Islam. Oxford University Press. ISBN 978-0-19-510799-9. Donner, Fred M. (2010). "Modern approaches to early Islamic history". In Robinson, Chase F. (ed.). The New Cambridge History of Islam. Volume 1: The Formation of the Islamic World, Sixth to Eleventh Centuries. Cambridge University Press. pp. 625–47. ISBN 9780521838238. Hart, Michael (1978). The 100:Ranking of the most influential persons in history. New York: Carol Publishing Group. ISBN 978-0-8065-1057-6. Hoyland, Robert G. (2014). In Gods Path: The Arab Conquests and the Creation of an Islamic Empire. Oxford University Press. Hughes, Aaron W. (2013). Muslim Identities : an Introduction to Islam. New York: Columbia University Press. ISBN 9780231161473. Khaddūrī, Majīd (2002). The Islamic Law of Nations: Shaybani's Siyar. JHU Press. pp. 19–20. ISBN 9780801869754. Koprulu, Mehmed Fuad; Leiser, Gary (1992). The Origins of the. SUNY Press. ISBN 978-0-7914-0819-3. Lapidus, Ira M. (2002). A History of Islamic societies. Cambridge University Press. ISBN 978-0-521-77056-9. Lewis, B. (1993). The Arabs in History. Oxford University Press. ISBN 978-0-19-285258-8. Nasr, Seyyed Hossein (2003). Islam:Religion, History and Civilization. New York: HarperCollins Publishers. ISBN 978-0-06-050714-5. Rahman, F. (1982). Islam & Modernity: Transformation of an Intellectual Tradition. University of Chicago Press. ISBN 978-0-226-70284-1. Rahman, H. U. (1999). A Chronology of Islamic History. Ta-Ha. ISBN 9781897940815. Robinson, Chase F. (2010). "Introduction / The rise of Islam, 600 705". In Robinson, Chase F. (ed.). The New Cambridge History of Islam. Volume 1: The Formation of the Islamic World, Sixth to Eleventh Centuries. Cambridge University Press. pp. 1–15, 173–225. ISBN 9780521838238. Sonn, Tamara (2004). A Brief History of Islam. Blackwell Publishing Ltd. ISBN 978-1-4051-0900-0. Ankerl, Guy (2000). Coexisting Contemporary Civilizations: Arabo-Muslim, Bharati, Chinese, and Western. INUPress. ISBN 978-2-88155-004-1. Hourani, Albert (2002). A History of the Arab Peoples. Faber & Faber. ISBN 978-0-571-21591-1.
al-Balādhurī, A. Y.; Hitti, P. K. (1916). The origins of the Islamic state: Being a translation from the Arabic accompanied with annotations, geographic and historic notes of the Kitâbfutûḥ al-buldân of al-Imâm abu l'Abbâs Aḥmad ibn-Jâbir al-Balâdhuri. New York. Williams, H. S., ed. (1904). The historians' history of the world: Parthians, Sassanids, and Arabs. The crusades and the papacy. New York: The Outlook Company. Le, S. G. (1900). Baghdad during the Abbasid caliphate: From contemporary Arabic and Persian sources. Oxford: Clarendon Press. Bentley, Jerry H.; Ziegler, Herbert F. (2006). Traditions and Encounters: A Global Perspective on the Past. New York: McGraw-Hill. Zaydān, J.; Margoliouth, D. S. (1907). "Being the fourth part of Jurjí Zaydán's history of Islamic civilization.". Umayyads and ʻAbbásids. Leyden: E.J. Brill, imprimerie orientale. "Islam Aflame with Revolt". The World's work. New York: Doubleday, Page & Co. 1900. Muir, Sir William (1877). The life of Mahomet: from original sources. Smith, Elder, & Co.
Irving, W. (1868). Mahomet and his successors. New York: Putnam. Sale, G.; Psalmanazar, G.; Bower, A.; Shelvocke, G.; Campbell, J.; Swinton, J. (779). A universal history: From the earliest accounts to the present time. 21. London: C. Bathurst. Rosenthal, Franz (1968). A history of Muslim historiography. Brill Archive. P. J. Bearman; Th. Bianquis; C. E. Bosworth; E. van Donzel; W. P. Heinrichs (eds.). Encyclopaedia of Islam, New Edition (1954-2005). Brill Academic Publishers. Berkshire Encyclopedia of World History. 4. Berkshire Publishing Group. 2005. ISBN 978-0-9743091-0-1. Baynes, T. S. (1888). The Encyclopædia Britannica: A dictionary of arts, sciences, and general literature. New York, N.Y: H.G. Allen. pp. 545–606 . Wikimedia Commons has media related to History of Islam.